Add your event at the end of this page! The statement is also downloadable as a PDF file in ENGLISH, FRENCH, and SPANISH. The poster for this year's World Day can be downloaded HERE. The eight associations forming the CCAAA (AMIA, ARSC, FIAF, FIAT-IFTA, FOCAL International, IASA, ICA, SEAPAVAA) strongly encourage all their members (and any other institutions) not only to join in the global celebrations of the 2018 World Day on and around 28 October, but also to share the information about their particular events, by filling the quick-and-easy form below (click on « Add a new World Day for Audiovisual Heritage event» below). Your descriptive text can be in the language of your choice (or even better... in several languages), but we ask you to limit it to 500 words max. You can also attach one image per event. Please fill in and submit one form per event. Your contributions will be automatically added to the list of Word day events on this page (the latest added event will appear at the top of the list). Click HERE to open a new window with a printable version of the list below. 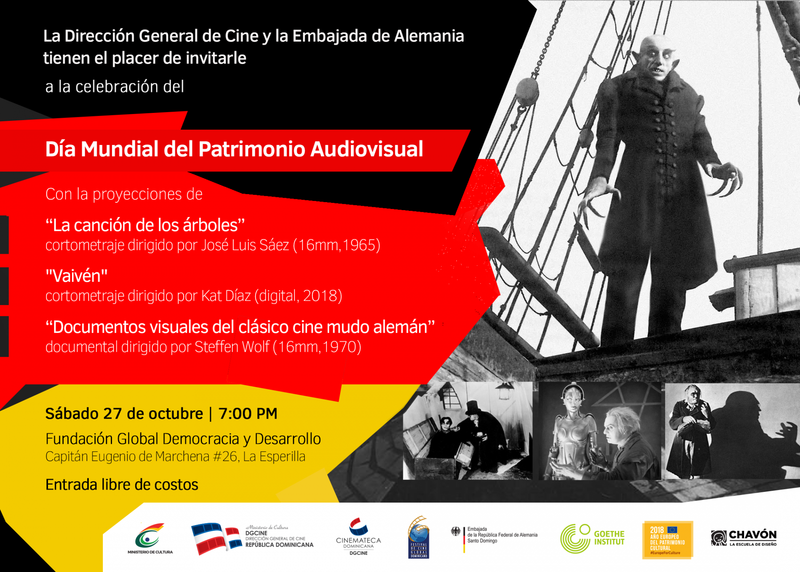 De igual forma, se presentará el documental alemán Documentos Visuales del Clásico Cine Mudo Alemán (16mm, 1970), dirigido por Steffen Wolf. 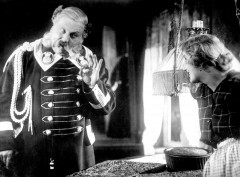 El filme nos presenta fragmentos comentados de 14 películas clásicas del cine mudo alemán, entre las cuales podemos destacar: Madame Dubarry (1919), Das Kabinett Des Dr. Caligari (1919), Das Wachsfigurenkabinett (1924) y Mutter Krausens Fahrt Ins Glück (1929). Los fragmentos se componen de secuencias completas. La selección pretende transmitir una panorámica de los logros del cine mudo alemán clásico e informar sobre su evolución, sobre sus realizadores principales y sobre los temas preferidos. 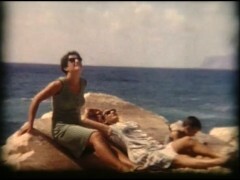 At the time of its making, "Miss Stone" was one of the most expensive and ambitious Yugoslav productions, the first Macedonian colour film to employ the Totalscope technique used in Cinecittà for filming historical costume dramas. Inspired by an event that took place in 1901, when Jane Sandanski’s unit of komitadji kidnapped the American Protestant missionary Ellen Stone in order to demand a ransom for her and use the money to finance an uprising in the struggle for independent Macedonia, the film of "Miss Stone", directed by Žika Mitrović, had to meet many expectations. 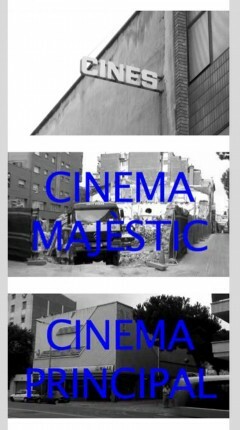 It was supposed to announce the newly established cinematography of Macedonia and promote it beyond Yugoslav borders. To present the Macedonian culture and history, but also to entertain the cinema-going audiences with both action and psychological drama. It had to serve as a springboard for Vardar Film and to help this new production company prove itself before the more experienced competitors on the Yugoslav film market, all of them being better staffed and technically equipped film production companies. Above all, it had to be a good film. Through photographs, several interesting details, press clippings, recorded memories of the authors and many other documents we tell the story of the "Miss Stone" movie: how the idea was developed into a script and then filmed by a hard-working and relatively inexperienced film crew. We reveal a parallel co-production project that almost ruined the prospects of the much anticipated new release, and facts and numbers about the premiere and the film’s triumph in cinemas all over the country. And we review the reasons behind the film’s forced descent into oblivion… only to have its myth resurrected again. In order to raise the awareness of the importance of the preservation of audiovisual heritage among our pupils, Croatian language teachers showed Croatian movies "Koko 3: Ljubav ili smrt" director by Daniel Kušan and "Breza" directed by Ante Babaja. Both scenarios for the films came from required reading school books. Pupils also watched "Forrest Gump" directed by Robert Zemeckis and "A dog's purpose" directed by Lasse Hallström. Younger pupils watched Croatian animated movie "Baltazar" made by Zagreb film 1967-1978, which is still popular among pupils. This day was marked in our school within the Erasmus project "Growing Up Digital". 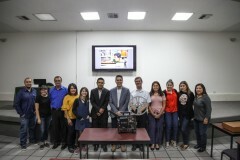 En la Universidad Autonoma de Baja California, se impartió en el marco del Día Mundial del Patrimonio Audiovisual, un curso-taller sobre Patrimonio Audiovisual y preservación videográfica en el Instituto de Investigaciones Culturales - Museo, en la ciudad de Mexicali. 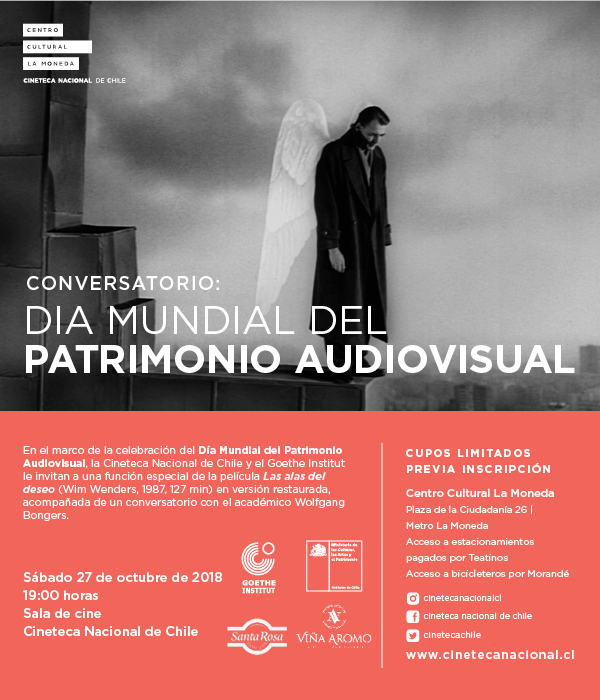 En el curso-taller que se realizó del 29 al 31 Octubre, se resaltó la importancia de salvaguardar el patrimonio audiovisual y se compartieron los conocimientos para preservar los documentos videográficos. Este taller fue impartido por el Mtro. Ubaldo Candia Reyna y se contó con la visita del Mtro. Daniel Sanabría, vicepresidente foraneo del Comité Mexicano del Programa Memoria del Mundo, quién felicitó a los organizadores, tallerista y participantes, resaltando la importancia y la contribución de este tipo de patrimonio. 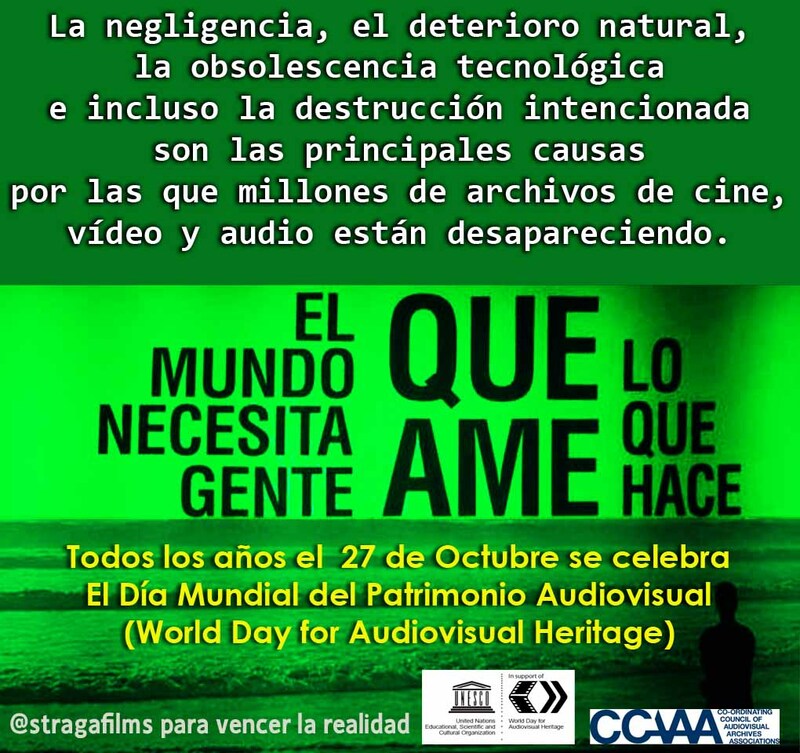 It's World Day for Audiovisual Heritage! 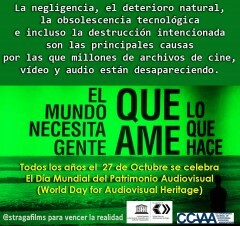 It’s World Day for Audiovisual Heritage! 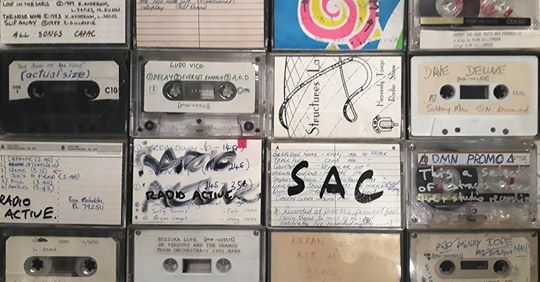 To celebrate the Library’s ongoing preservation of the recorded sounds and music of New Zealand, we bring to you the Radio Active 89FM Collection. 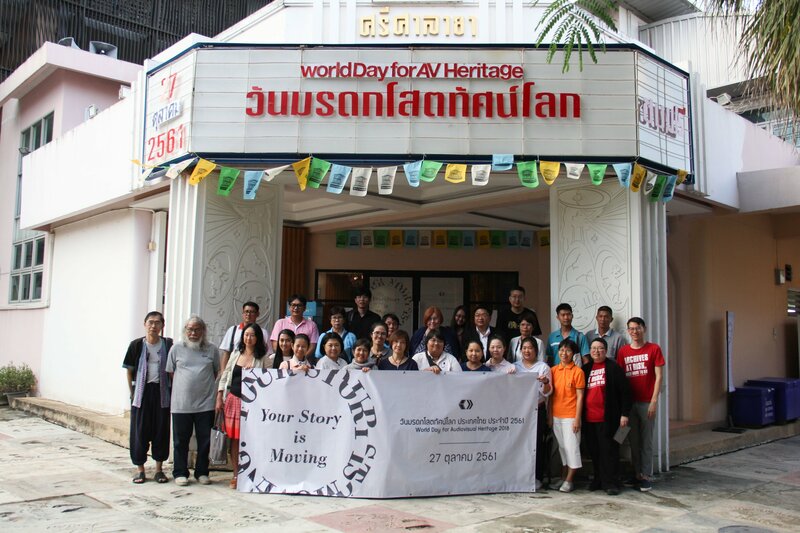 The Film Archive (Public Organization) collaborated with UNESCO Bangkok and the audiovisual archives in Thailand to organize the World AV Heritage Day 2018 celebration on 27 October 2018 to present the AV heritage of Thailand. The event began with the opening remark by Ms.Misako Ito, the Regional Adviser for Communication and Information of UNESCO Bangkok and the reading the Thai translation of the CCAAA Board's official statement about this year's theme by Ms.Chalida Uabumrunjit, the director of the Film Archive. The first panel was the lauching the Thai translation of Dr.Ray Edmonson's Audiovisual Archives : Philosophy and Principles book. The guest speakers were Mr. Dome Sukvong, the founder of the Film Archive and Ms.Kannika Chivapakdee, the founder of the Museum and Archive of the Public Relation Department of Thailand. The AV heritage presentation started with the screening of the national Thai film heritage, the 2nd professional Thai golf tournament in 1931. The presentation was narrated by Mr.Arnan Puakpiboon, the Secretary General of Professional Golf Professional Association of Thailand, who told the significant of this 4 min footage for the history of golf sport in Thailand. Ms.Pawida Somwong, the archivist of the National Archives of Thailand presented "the Managment of the Glass Plates Negatives Collection". 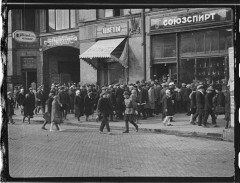 The Glass Plates Negative collestion was registered as UNESCO Memory of the World in 2017. Ms.Pawarisa Nipawattanpong from the Museum and Archive of the Public Relation Department of Thailand presented the newly discovered the recording of the daily opening and closing words of national radio station of Thailand. Last but not least, Mr. Pluethipol Prachumpol, the director of the First Antique Phonograph Museum, presented the first recording of the royal anthem recorded in 1900 in Berlin. The celebration was closed by Mr.Pluethipol Prachumpol inviting all participants led by Mr.Dome Sukvong to record the voice with Thomas A Edison's phonograph. It was the histocal record that, hopefully, the participants of Wolrd Day of AV Heritage in next century, namely 2118, would be able to play. "Nuestro patrimonio cultural se yergue sobre columnas modeladas por diversas manifestaciones sociales que, con el tiempo, han sido talladas para presentarse como pilares esenciales. Estas columnas han sido forjadas con materiales intangibles, como sonidos, voces y música. Extensiones del pensamiento que dan sentido al patrimonio cultural. Columnas sonoras que irradian conocimiento a través de un testimonio, belleza mediante la palabra hablada o cantada, creación mediante la organización de sonidos expresados en la música y que nos concilian con nuestro entorno sonoro natural. 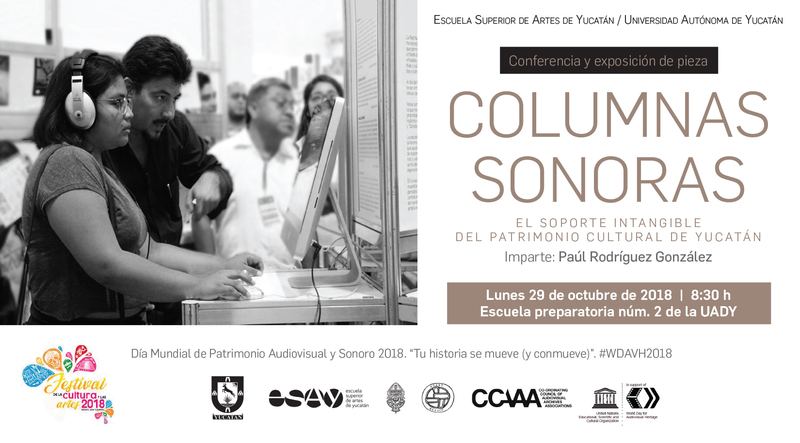 Las columnas que se presentaran están solidamnete construidas con cuatro tipos de manisfestaciones sonoras: Música de Yucatán, Literatura yucateca, Paisaje sonoro y Arte sonoro, todas ellas presentan historias que se mueven y nos conmuven..."
Quién es el RESPONSABLE del destino de los archivos cinematográficos y audiovisuales en Venezuela? 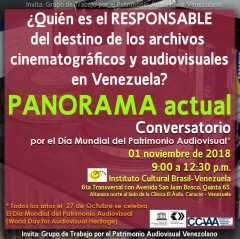 Nuestro grupo de trabajo continúa con la revisión y la preparación del flujos de trabajo de la propuesta sobre las Normativas Mínimas para la Preservación y Conservación de los Archivos Cinematográficos Digitales (NMPCACD), entregada al CENTRO NACIONALA AUTONOMO DE CINEMATOGRAFÍA CNAC, para sean incorporadas al marco legal creado para resguardar la obra audiovisual. 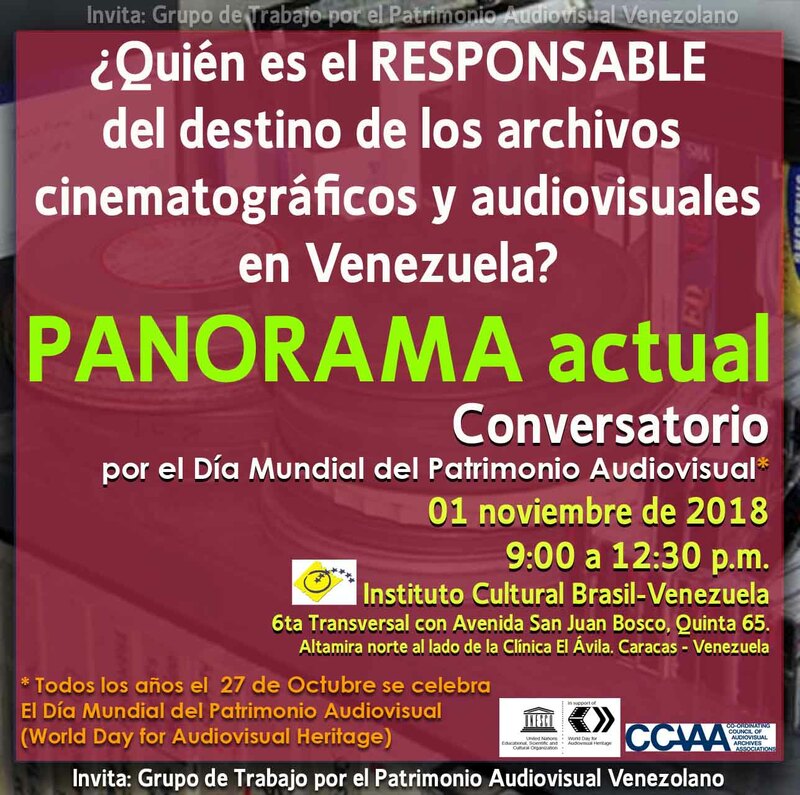 También le informamos que conjuntamente con personas particulares, instituciones públicas, gremios y asociaciones y empresas privadas comprometidas con el patrimonio audiovisual, como en años anteriores nos reuniremos el 1 de noviembre para celebrar con un coloquio el Día Mundial del Patrimonio Audiovisual. King Hu's acclaimed Chinese-language classic "Raining in the Mountain" was screened for the first time after its 4K restoration on Oct, 25th, 2018 at Huashan Spot Theater in Taipei, Taiwan. Among the audience were the film’s original cast members and their families, as well as representatives from the Ministry of Culture and TFI. 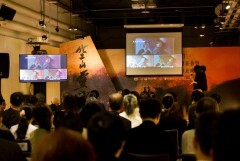 Both the chairman and director of TFI spoke about the rising awareness of film preservation and restoration in Taiwan. This awareness is the founding rock on which we can hope to bring back our collective memory expressed through audiovisual arts. It is thus especially meaningful to screen TFI’s very first self-restored feature-length film “Raining in the Mountain” on World Day for Audiovisual Heritage. 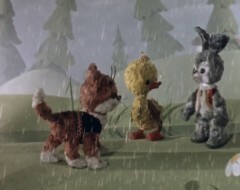 The total running time of “Raining in the Mountain” is 120 minutes, but only 90 minutes remain on its original negative. This new 4K restoration is based on the combination of segments found on its original negative, dupe negative and print, respectively provided by TFI, HKFA, and KOFA. The overall condition of the film has been largely improved after color correction and grading, but it is still limited to an extent as different source materials exhibit different inherent qualities. 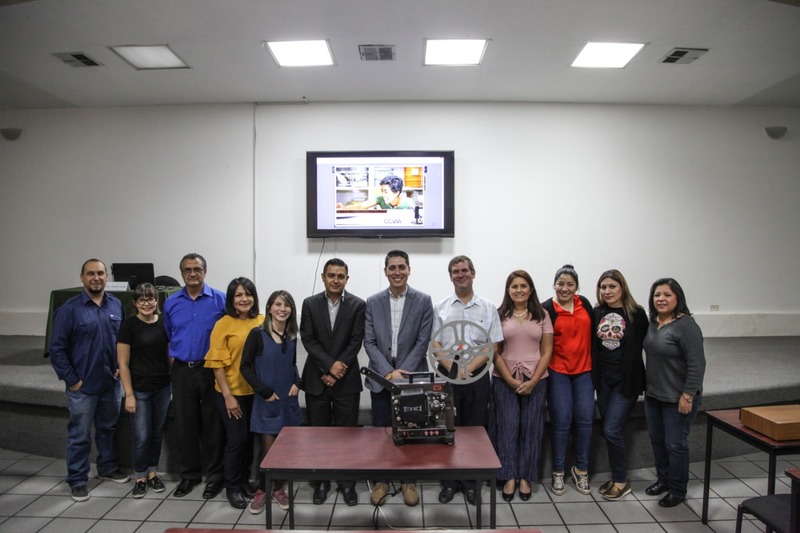 Apart from a screening, the event also consisted of a briefing on the restoration process and a comparison of the before-and-after images which further demonstrated the enhancement that can be brought forth by restoration. 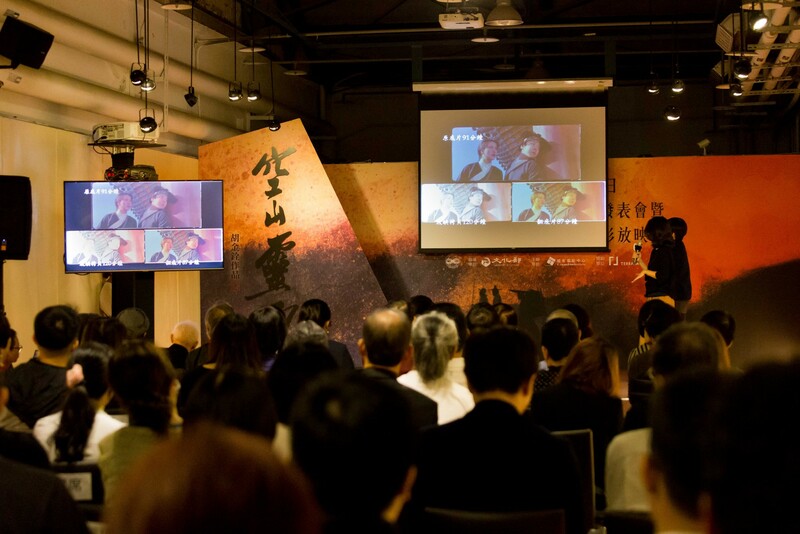 The event celebrated both the world’s audiovisual heritage and the fact that heritage can continue to shine a light on our lives in its restored glory. The Smithsonian's Archives of American Art celebrates the 2018 UNESCO World Day for Audiovisual Heritage by trying to answer this question: Why would archives invest in new copies of films that have already been copied to a useable format? 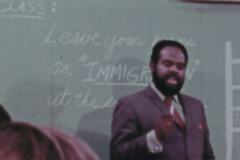 To illustrate this complicated tale, we are pleased to present as a case study the Cornelia Chapin Home Movies, found in the papers of artists Marion Sanford and Cornelia Chapin, and recently preserved with a grant from the National Film Preservation Foundation (NFPF). A village in Mexico and the Holy Week, a hit-and-run car accident, and a tequila-drinking police chief – and a film team from Göttingen at the heart of it all. 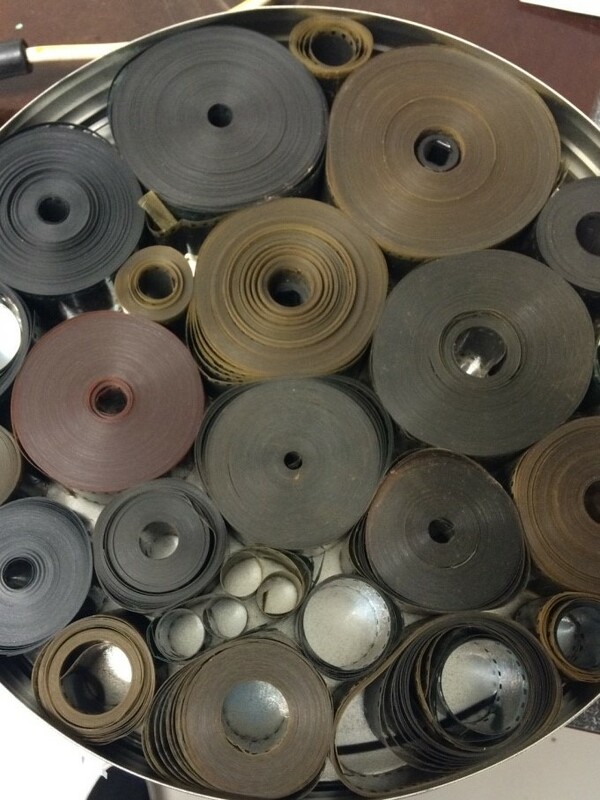 Six binder files and reels and reels of film material tell the adventure of an expedition to Mexico 30 years ago. With the “unearthing” of an ethnological film treasure, the preliminary end of the tale can be told in 2018. Towards a shared standard terminology in the description of audio phenomena in sound archives of the global digital era. Gecko will present publicly on the internet a video presentation about an aspect of the audio archiving practice. 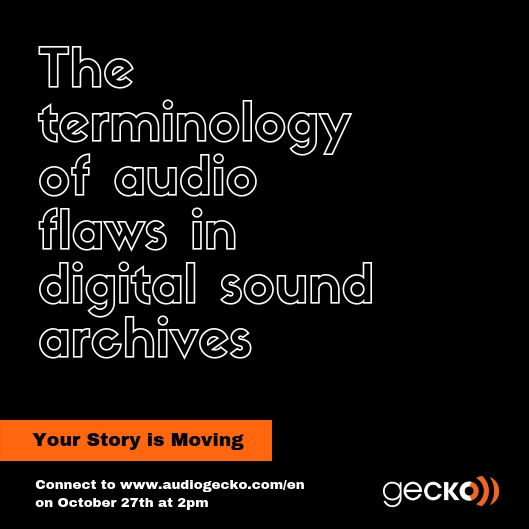 On the occasion of the 2018 World Day For Audiovisual Heritage on October 27th, Gecko will present publicly on its website at 2pm (UTC 2) the entitled study Towards a shared standard terminology in the description of audio phenomena in sound archives of the global digital era. Initially given during the IASA 2018 Annual Conference in Ghana on October 3rd, 2018, it will be led and recorded by its project manager Emiliano Flores. To open more widely the debate to those who are absent, but also to people interested in the subject, whatever your place of residence and involvement in the field of the archive, this video will serve as a basis for discussion and reflection on the issues it raises. The description of audio flaws and peculiarities of a sound document is part of the audio archiving practice as it formulates the link between the history of the carrier and the nature of the recorded sound, at the time of digitization. In a context of worldwide globalization and sharing, the accessibility of audio collections cannot do without a good understandability of the idioms used in this description. Yet, we observe that the terminologies used are not the same between two countries, two institutions, two digital collections, two digitization operators. With 13 years of experience in digitizing audio carriers for major European institutions, Gecko has acquired a valuable knowledge of these issues and wishes to share a practical survey on the homogenization of the specific descriptive audio technical words, based on past and on-going digitization projects. An approach will be proposed by Emiliano Flores that avoids both inaccurate or erroneous idioms and prevents the coexistence of many different words for one audio phenomenon. The presentation also aims at opening a discussion on the topic of one-to-one idiom matches between languages, with the future in mind. On the occasion of the World Day for Audiovisual Heritage the Historical Archives of the European Union published an interview of Professor Gabriele Clemens, tackling the importance of audio-visual documents. Professor Clemens explained why audio-visual material can be used as primary source in historical research, and which are the main difficulties which users face when handling this particular type of documents. The HAEU’s daily work is aimed at making accessible the audio-visual recordings and images that define the European cultural heritage. From the scenes included in this short video, we see how A/V media demonstrate the historical motivations for a unified, peaceful Europe, and their role in promoting a shared European identity over the years. It has been published on EUI’s YouTube channel and is now available at this link. Professor Gabriele Clemens holds a Jean Monnet Chair of European Integration History and European Studies at the University of Hamburg, Germany. She is the author of the book “Werben für Europa” and has recently carried out original researches on HAEU audio-visual heritage. Her project “Europafilme” will be presented and discussed during the Seminar “Advertising Europe” – Films on European integration between Information and Propaganda, to be held at EUI in Florence on 29 October 2018. To mark the 80th birthday of FIAF, which was officially launched on 25 October 1938, and celebrate the 2018 World Day for Audiovisual Heritage, we are pleased to announce that 648 audio tapes (1/4” open reel and audio cassettes) documenting the history of FIAF Symposia, General Assemblies and Executive Committee meetings dating from 1975-2006 are now properly housed, preserved and digitized, and many of them freely accessible online, thanks to the crucial (and generous) assistance of the Indiana University Libraries Moving Image Archive (IULMIA). For further information on this digitization program, please contact Christophe Dupin (c.dupin@fiafnet.org) or Rachael Stoeltje (rstoeltj@indiana.edu). Book a Visit to See our Brand New Scanning Station. 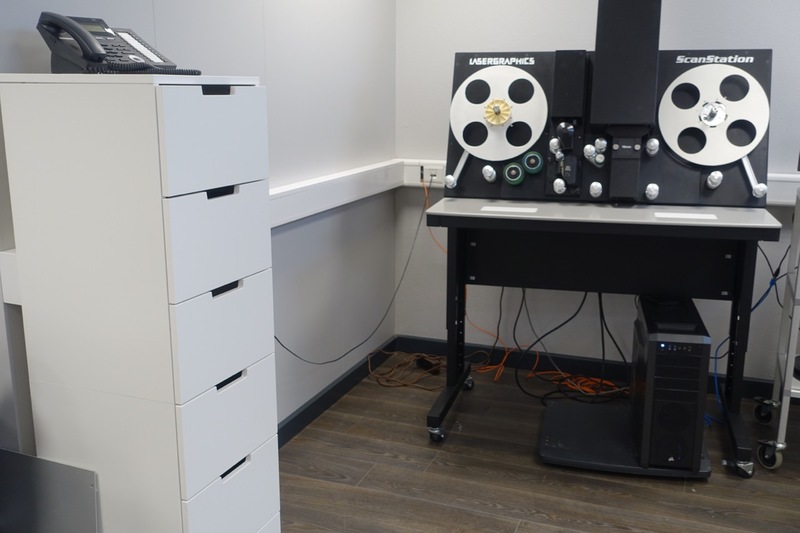 The National Film Archive of Iceland has chosen the 2018 World Day for Audiovisual Heritage for it's announcement of the formal opening of it´s new scanning station after one year of installation, testing, development etc. It has got a new ScanStation scanner (5.1K) from Laisergraphics, 260TB server from Metastore, a refurbished LipsnerSmith film washing machine, colorgraded screens, computers and applications for this purpose and now work on restoration of films is in progress in accordance with the film archive's preference list. Three titles are toplisted: The Last Farm in the Valley (1950), The Saga of the Borg Family (1920) and Iceland in Moving Pictures (1925). The Last Farm in the Valley is going to be screened with a life performance of the National Symphony Orcestra in upcoming December and The Saga of the Borg Family at the Giornate in Pordenone next year. Mondays are reserved for service with the Archice's clients, mainly film producers who need access to mostly documentary material for their productions. Groups of people e.g. from workplaces, institutions, schools, etc. are invited to book themselves and come and visit the Archive to be guided through it's premises with the main focus on the scanning station and it's operation. The Hungarian National Film Fund – Film Archive presents two fully restored Hungarian classics on World Day for Audiovisual Heritage. From 2 pm, we are screening Zoltán Fábri’s Hannibál tanár úr/Professor Hannibal, which proved a big hit at the Lumière Film Festival in Lyon in mid-October. 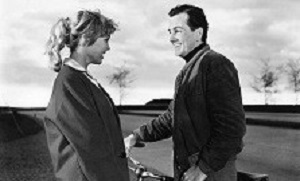 The film won first prize at the Karlovy Vary festival in 1957. From 4 pm, Péter Bacsó’s satire made in 1969 but banned for 10 years, A tanú/The Witness, will be on the programme. The Witness is one of the most successful Hungarian cult films, with its quotations becoming bywords and its characters symbols. This is the first time an audience can see the fully restored film, then it is rereleased to cinemas across the country from 8 November. The Italian Home Movies Archive was born in 2002, with the mission to collect and preserve amateur and expermental cinema in small guage film formats (Super8, 8mm, 16mm, 9.5mm), an audiovisual heritage that is still hidden and largely inaccessible. 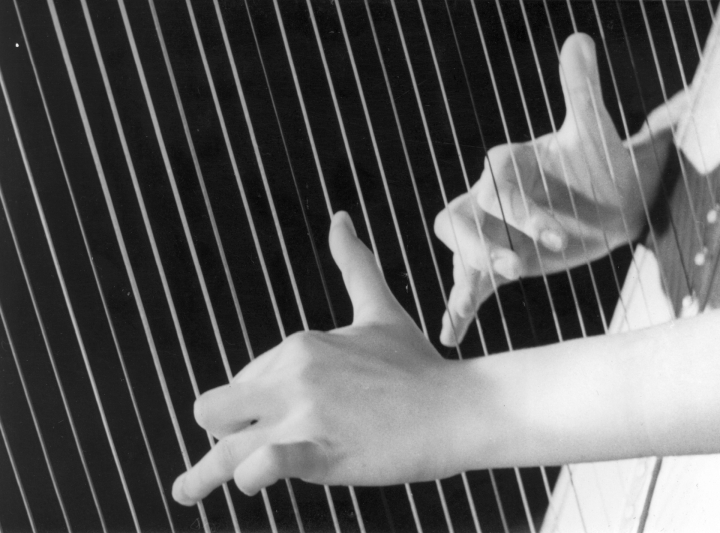 The Archivio Aperto Festival (2018, 11° editions) celebrates the audiovisual privae heritage with screenings,meetings and workshops. 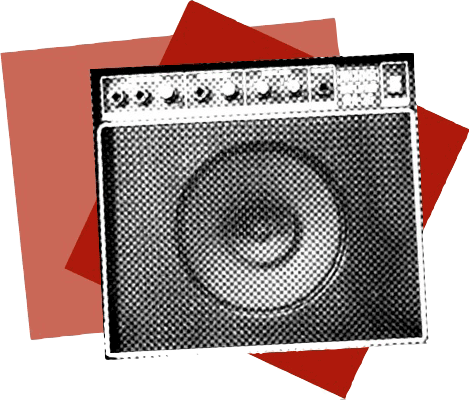 The Netherlands Institute for Sound and Vision is celebrating the World Audiovisual Heritage day by announcing a new venture - a GIF collection! GIFs are tiny looping animations that play a large role in the day to day digital communication and have done so for a couple of decades now. They are a great example of the contemporary remix culture where audiovisual materials are continuously reused and reinterpreted. They help us share stories with one another and express our feelings through immediate visual cues. It is about time we start considering GIFs as part of our cultural heritage that needs to be preserved for the future generations. But where do we start? What GIFs should be collected and where do we find them? GIFs are scattered all over the internet and different social platforms. An important aspect of the contemporary participatory culture online is that digital artefacts like GIFs belong to the communities of users who make, remake and share them. If we want to make a GIF collection, we need to get these communities involved in the process. On the 26-28th of October, we will use our Instagram channel to let our audiences decide what should be included in a Dutch GIF collection. Our followers will be able to vote on the GIFs that they want to see preserved for the future. You can read more about the GIF collection here. 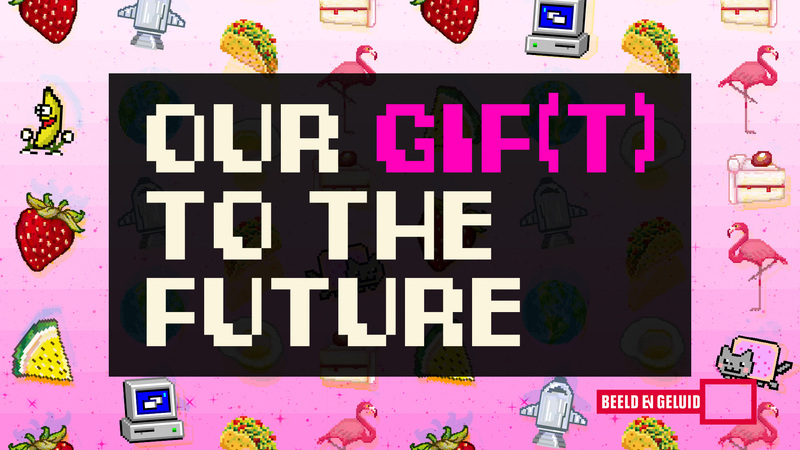 Take a look at our GIPHY channel where we make our own GIFs using archival collections and make sure to follow us on Instagram @beeldgeluid to get involved in the creation of a GIF collection! 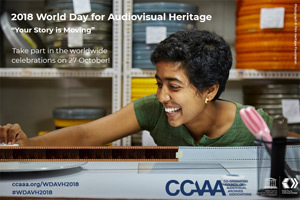 National Film Archive of India (NFAI) would be celebrating ‘The World Day for Audiovisual Heritage’ tomorrow by putting up a poster exhibition at its premises. The exhibition titled ‘Mahatma on Celluloid’ will showcase the influence of Gandhian values in films across various languages. 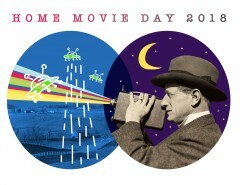 Home Movie Day this year is a week before WDAVH and we have over 15 venues all over Japan. FPS is always asking organizers to send us their photos, flyers, and possibly short reports. In return we will send the bag (designed by Ymi Kohsaka) to them as a small gift, and of course ask them to promote WDAVH in their own communities. We are also ready to put up Sanchai Chotirosseranee's interview by film researcher Norihiko Nakamura (Kobe University) on our website both in Japanese and English. Since we already have Brigitte Paulowitz's article on her volunteer activities in Thailand back in 2004 and Chalida Uabumrungjit's article on the history of film archiving in Thailand in 2015 (originally published in the FIAF journal) in Japanese, this latest interview is going to be another informative update, and we hope more people will be aware of things going on in SE Asian film archiving. Restoration of Japanese underground films from the 1960s and 70s directed by Motoharu Jonouchi. 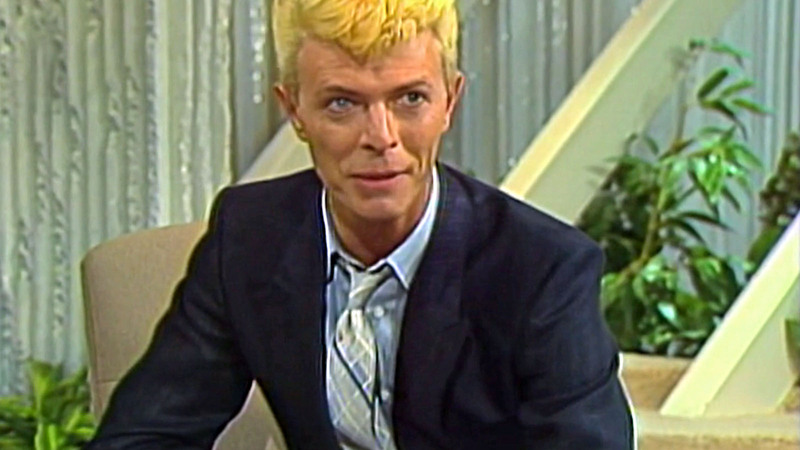 One of the thousands of 'moving stories' that have reached a new audience through digitisation is this clip of David Bowie's rare appearance in the final episode of The Don Lane Show on 10 November 1983. 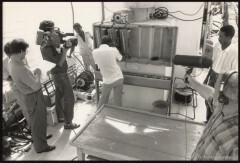 That's why NFSA Chief Curator Gayle Lake and Assistant Video Preservation Specialist Richard Vorobieff explain, in a new interview, that audiovisual collections are hugelly important to a nation's identity - and, most importantly, why digitisation of video tape is a challenge that can't wait. On World Day for Audiovisual Heritage, you can also spend hours exploring the NFSA's 135 curated collections and 10 online exhibitions, at home or on the move. The National Archives of Singapore presents a selection of audiovisual materials and oral history interviews that we have collected and judiciously preserved over the past 50 years for you and our future generations. They capture the times that Singaporeans celebrated, stood up proudly and even cried. Travel to scenes that have vanished and enjoy the treasured memories of Singaporeans from different walks of life. 19:30: Videoconferencia de Ray Edmondson (con traducción simultánea). Al finalizar el Archivo General de la Nación presentará su campaña de concientización. 21:00: Lumiton Usina Audiovisual presenta: digitalización y uso creativo de maquinarias de cine analógico. 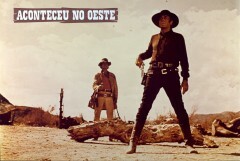 Os arquivos audiovisuais contam histórias sobre a vidas e culturas das pessoas de todo mundo. Eles representam uma herança inestimável, uma afirmação da memória coletiva e uma valiosa fonte de conhecimento, uma vez que refletem a diversidade cultural, social e linguística das nossas comunidades. Esses arquivos ajudam a crescer e a compreender o mundo partilhado por todos. Conservar esse património e garantir que ele permaneça acessível ao público e às futuras gerações é um objetivo vital para todas as instituições de memória, bem como para o público em geral. O DMPAV é uma comemoração da adoção, em 1980, pela 21.ª Conferência Geral, da Recomendação para a Salvaguarda e Preservação de Imagens em Movimento. 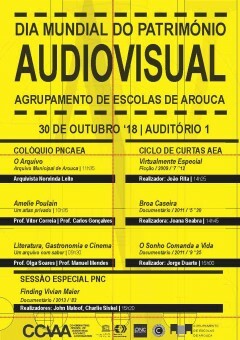 O DMPAV oferece uma oportunidade para aumentar a consciencialização geral sobre a necessidade de tomar medidas urgentes e reconhecer a importância dos documentos audiovisuais. 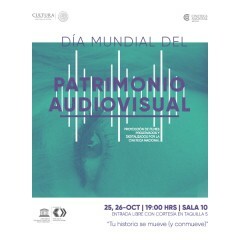 Feliz Dia Mundial do Património Audiovisual! In celebration of World Day for Audiovisual Heritage on October 27, 2018, The Association for Recorded Sound Collections has made sound recordings and selected slide presentations from ARSC’s 45th, 46th, and 47th annual conferences publically available. Earlier this year, the American Archive of Public Broadcasting (AAPB) launched FIX IT , a crowdsourcing tool that invites the public to help improve the searchability of over 50,000 hours of historic public television and radio programming. Now, with the generous support of George Blood, a digitization service provider, the AAPB is launching the Transcribe to Digitize Challenge! 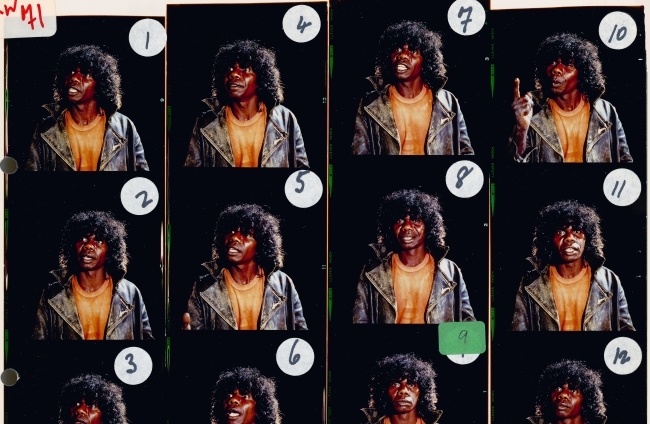 The challenge is simple: George Blood will digitize 20 tapes (for FREE!) for every 20 transcripts corrected per station collection. These collections include interviews, local newscasts, and educational programming from WGBH, Wisconsin Public Television, Louisiana Public Broadcasting, Rocky Mountain PBS, and more! Want to see how AAPB's stations are participating? Take a look at Louisiana Public Broadcasting! With funding from the Institute for Museum and Library Services (IMLS), the AAPB has made strides at making the collection more discoverable by creating speech-to-text transcripts of the audio and video in the collection. These transcripts can be used to improve accessibility of the collection through the addition of new keywords and by exposing the time-stamped transcript alongside the media player on the AAPB website. However, these computer-generated transcripts lack accuracy, and the AAPB is seeking the help of the public to correct them. 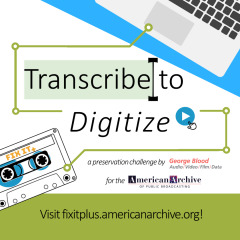 For the Transcribe to Digitize Challenge, a minimum of 20 transcripts must be corrected for a station to meet the challenge, and George Blood will then provide free digitization for 20 tapes selected by that station. Up to 100 transcripts can be corrected for 100 tapes to be digitized per station. The digitized materials will be delivered back to each station, and a copy will also go to the AAPB for long-term preservation at the Library of Congress and access through the AAPB website! Chicago Film Archives and the Chicago Film Society join forces to present CHICAGO HOME MOVIE DAY at the Chicago History Museum. 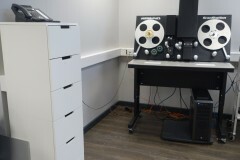 On 27 October 2018, the World Day for Audiovisual Heritage 2018, the British Library will release a set of messages and time-lapse videos on Twitter and other social media highlighting the preservation story of an analogue magnetic audiotape from its collections being prepared and digitised for permanent preservation. We carried out this work as part of “Unlocking our Sound Heritage”, a 5-year, UK-wide project that will help save the nation’s sounds and open them up to everyone. The project is itself a core component of the Library’s major Save our Sounds programme. 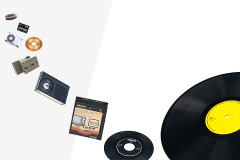 The tape's story starts with it being retrieved from the tape stores, being catalogued, the playback tape deck prepared, then the recording digitised. 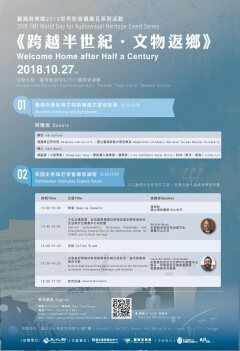 Follow https://twitter.com/BLSoundHeritage and https://twitter.com/soundarchive on 27 October! Slovak Film Institute is celebrating the World Day for Audiovisual Heritage by special screening on 27th October in Kino Lumière, the Cinema of the Slovak Film Institute, a selection of the digitally restored short documentary films produced in 1963, which is also the year of establishment of the Slovak Film Institute. 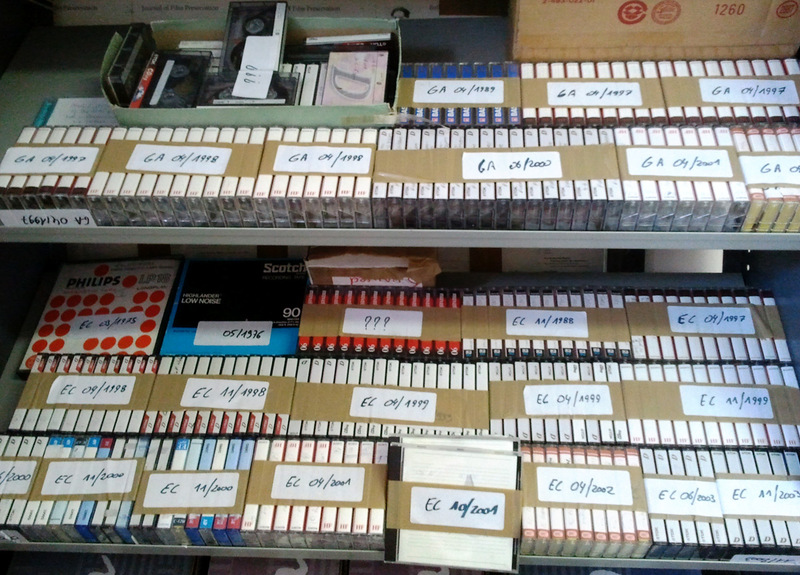 The films, are part of the collection of the National Film Archive of the Slovak Film Institute (SFI) and were digitally restored mostly in the recent past. 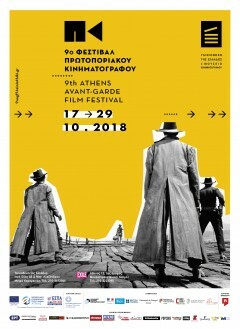 Films in this program: Chlapi z Gaderskej doliny (dir. Ladislav Kudelka), Kuchári (dir. Ivan Húšťava), Predčasná reportáž (dir. 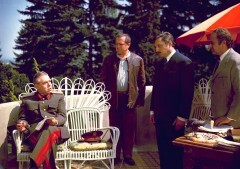 Jaroslav Pogran), Rozhovor (dir. Otakar Krivánek), Ruky (dir. Jozef Zachar), Voda a práca (dir. Martin Slivka). 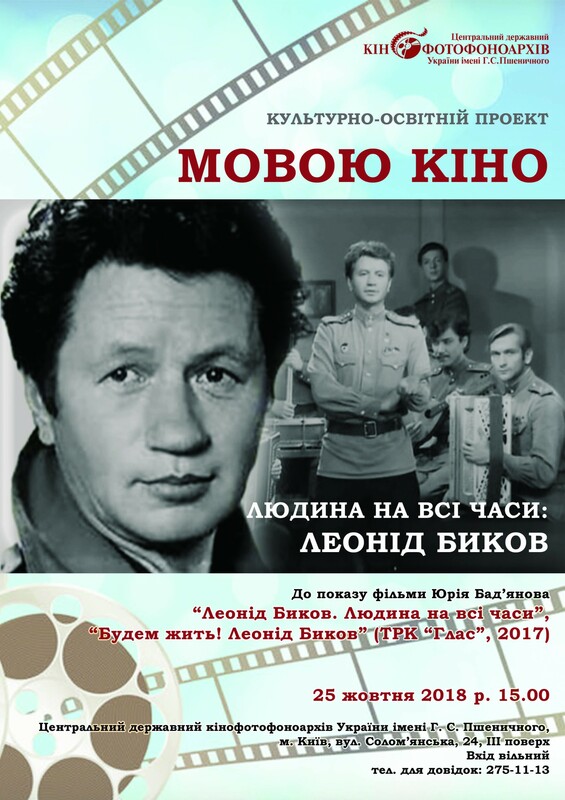 At October 27, 2018, Central State CineFotoFono Archive of Ukraine conducts a cinema lecture "The Man for All of the Times: Leonid Bykov" in the context of this year's International day of visual heritage "Your History Impassionates". A short presentation of audiovisual documents about the Ukrainian actor, film director, and the laureate of the State Award of Taras Shevchenko Leonid Bykov from the funds of the Central State CineFotoFono Archive of Ukraine. Screening of the films "Leonid Bykov: The Man for All of the Times" by Y. Badyanov and "We Will Live! Leonid Bykov" by "Glas" television and radio company. We invitee anyone to join the event - from professional filmmakers and film theory scientists to amature fans of the cinema. As the most important music archiving Institution in Taiwan, the Taiwan Music Institute has been committed to the preservation of precious audiovisual literature for many years and has also received donations from all parties. In order to thank these donors, we hosted a special donation ceremony on the morning of the World Day for Audiovisual Heritage. 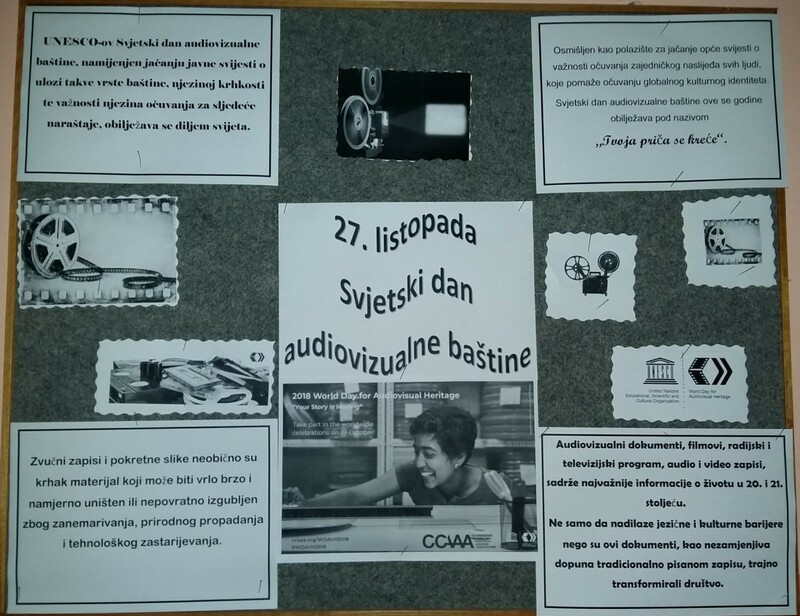 This year we are particularly pleased to receive a number of music artifacts from the Ostasien-Institut e.V. (Bonn, Germany) that have been preserved since the 1960s, as well as hundreds of the historical fieldwork recording tapes from music department of National Taiwan Normal University, and personal donations from violinist DENG Chang-Guo, Pianists Lina Ye and Rolf-Peter Wille and singer Jimmy Lin. In the afternoon, we invited Michael Mason and Dave Walker, two experts from the Smithsonian Institution, to share how they built a sustainable development in national museums to transfer knowledge, preserve valuable literature, promote mass education, and strengthen community connections. Welcome to join us! 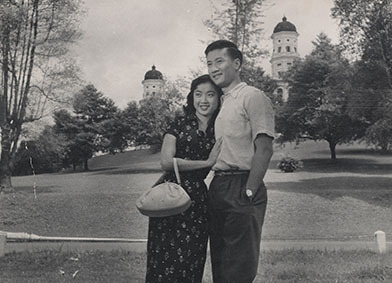 In celebration of World Day for Audiovisual Heritage, the Asian Film Archive has partnered with Perennial Group to screen a Kong Ngee classic, Moon Over Malaya 椰林月 (1957), to 400 eldery beneficiaries at the grand Capitol Theatre in Singapore. 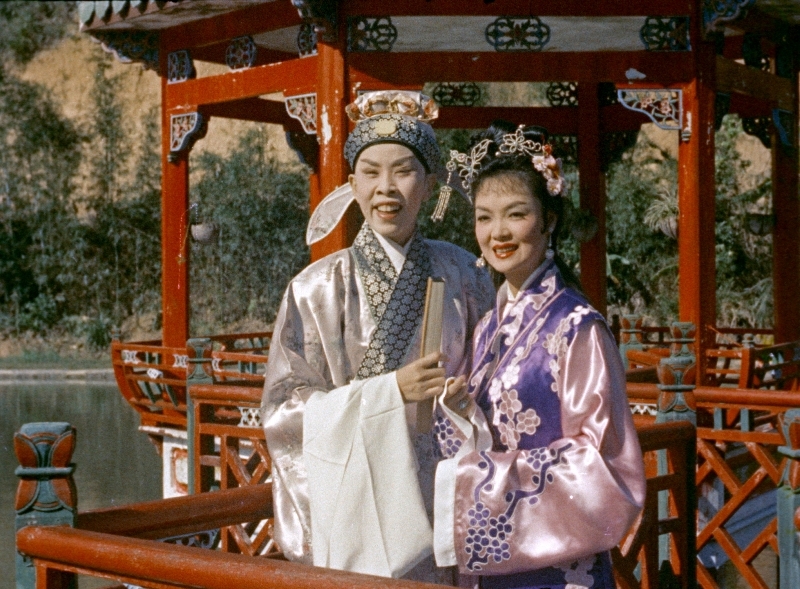 Restored by the Asian Film Archive, Moon Over Malaya starred youthful idols of the time, 谢贤 (Patrick Tse Yin), 嘉玲 (Patsy Kar Ling) and 南红 (Nam Hung), and was part of the Nanyang Trilogy films that introduced urban perspectives and appealed to the younger postwar audiences. 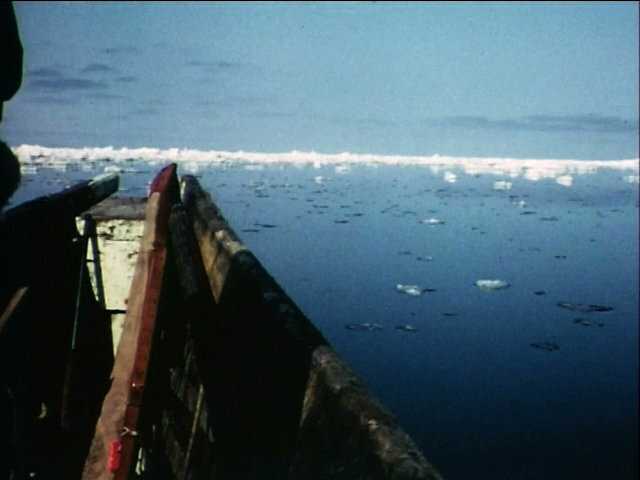 In recognition of American Archives Month, and UNESCO/CCAAA World Day for Audiovisual Heritage, the Alaska Moving Image Preservation Association (AMIPA)--in conjunction with the University of Alaska Anchorage's (UAA) Department of Journalism and Communications course, Documentary Filmmakers and Filmmaking--will present a screening of "East of Siberia," from AMIPA's Ed Shepherd collection. 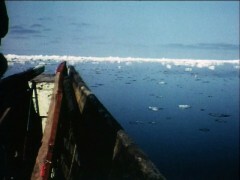 "East of Siberia" is an amateur documentary about life on St. Lawrence Island, in the Bering Sea, compiled from sequences shot by Shepherd, a visiting Alaskan fur trader, during trips made to the island between the late 1940s and early 1960s. The filmmaker only made two prints of the film, which was never distributed. Prior to its donation to AMIPA in 2006, it had only been seen by Shepherd's family and friends. The 16mm print that will be presented is a restoration made possible by a 2008 grant from the National Film Preservation Foundation (NFPF). The restoration work was performed by Triage Motion Picture Services, DJ Audio, and Audio Mechanics. The film will be projected with an Elmo CX-350 16mm film projector, featuring a 350w xenon lamp. The program will also include a short subject, consisting of some recently restored silent, unedited 16mm footage. The screening will take place Thursday, 10/25, in the UAA/APU Consortium Library, room 307, at 6:30 pm. This event is free, and open to the public. 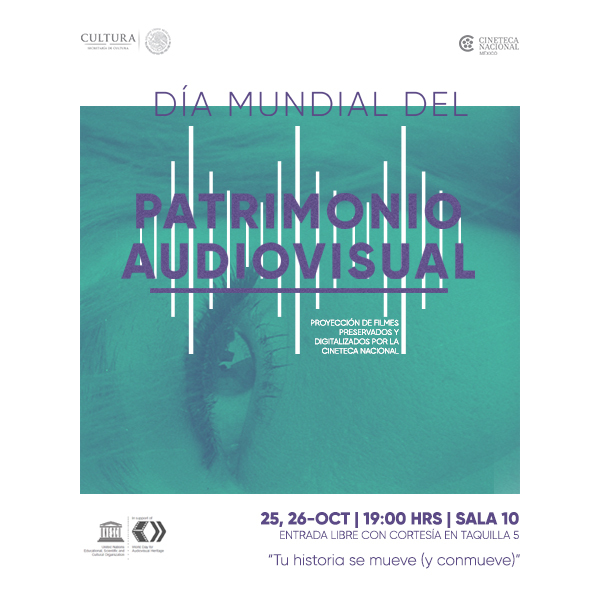 Join Indiana University’s celebration of the World Day for Audiovisual Heritage, a UNESCO event centered around raising awareness of collective culture recorded on audiovisual media. This screening will focus on this year’s theme, “Your Story is Moving,” through a series of shorts and excerpts about immigration. The program will explore many kinds of “moving” involved in immigration: the physical moving from one country to another; the way these stories are emotionally moving to experience and to hear about; and the way that these narratives about immigration are moving through time to shape our understanding in the present. The event is free, open to the public, and is hosted by the IU Libraries Moving Image Archive in collaboration with the IU Libraries Diversity Committee. 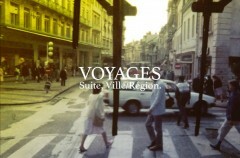 Si les temps et les villes changent, les lieux restent comme en témoigne le paysage cinématographique de la ville de Zurich. La Cinémathèque suisse organise une visite guidée d'une heure et demie dans la vieille ville (Stadtkreis 1) en compagnie de Matthias Uhlmann, historien du cinéma, pour découvrir des édifices ayant accueillis des théâtres d’ombres (autour de 1900) ou d’anciennes salles de cinéma qui, pour certaines d’entre elles, projettent encore des films. 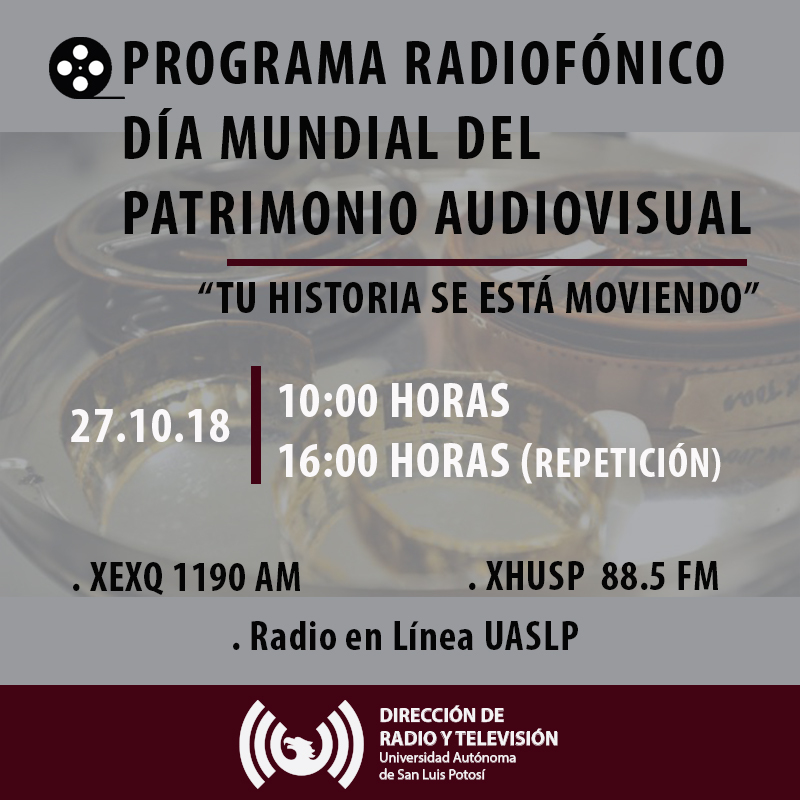 Un événement qui s’inscrit dans le cadre de la Journée mondiale du patrimoine audiovisuel de l'UNESCO, le 27 octobre 2018. Rendez-vous est fixé à 11h, Hechtplatz, Zurich. Nombre de participants limité. Inscription obligatoire sur cszh(at)cinematheque.ch. 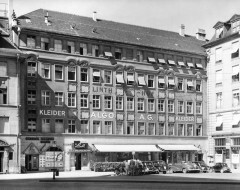 Zeiten und Städte wandeln sich, und so auch die Stadtzürcher Kinolandschaft - die Stätten aber bleiben. 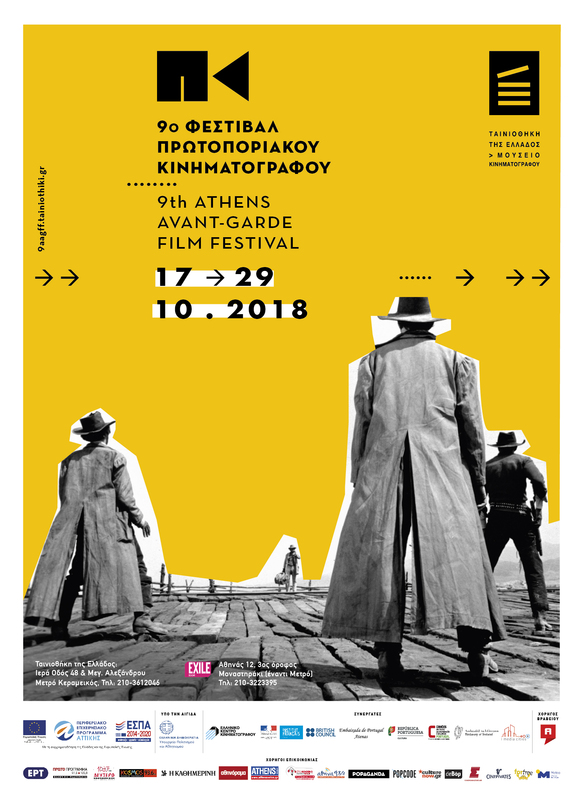 Ein rund 90-minütiger Spaziergang mit dem Filmwissenschaftler Matthias Uhlmann im Stadtkreis 1 führt an Orte, an denen Lichtspieltheater ab 1900 bewegte Bilder zeigten, oder - im besten Fall - dorthin, wo heute noch «Kinos» Filme projizieren. 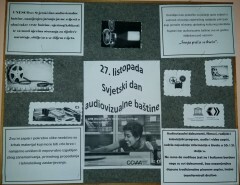 Die Veranstaltung erfolgt im Rahmen des UNESCO Welttags des audiovisuellen Erbes am 27. Oktober 2018. Treffen: Hechtplatz, Zürich, 11 Uhr. Teilnehmerzahl begrenzt. 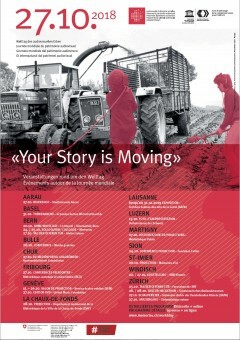 Um Anmeldung wird gebeten an: cszh(at)cinematheque.ch. Connecting with the AV archiving & digital culture communities to explore the experiences, issues, inspirations & challenges of caring for our sound & moving image heritage. In honour of the 2018 Unesco World Day for Audiovisual Heritage, the AV Think Tank - an international group of experts from the audiovisual and sound archiving and digital culture communities initiated by the Netherlands Institute for Sound and Vision - are releasing the first episode of their new podcast series Stories of AV Archives. This new series seeks to make the work of AV Archives important, familiar and interesting to those not necessarily embedded within our professional communities, but also engage listeners who are active practitioners in the field by speaking to and sharing their stories, ideas, issues, challenges and inspirations. Stories of AV Archives speaks to listeners on both sides by sharing experiences from within the field, and by championing the importance of this work by making it relevant to an audience that perhaps is unaware of what's at stake in sound and moving image archiving and the ways in which this work impacts and comes in contact with their daily lives. The first episode, released Friday, October 26 in advance of Saturday’s Unesco World Day for Audiovisual Heritage, jumps right in, introducing the new series and speaking with a number of the members of the AV Think Tank about their perceptions of the significance of AV archives. 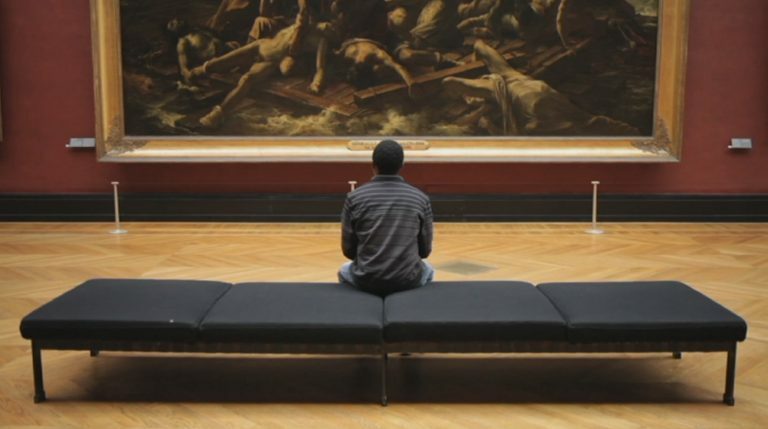 Upcoming episodes will focus on a particular theme and connect with the wider community of AV archiving and digital culture professionals as well as other important practitioners such as filmmakers, musicians, artists, activists, educators and historians. Find out what kind of audiovisual material you have in your possession, whether it has any heritage value and how you can preserve and digitise it. 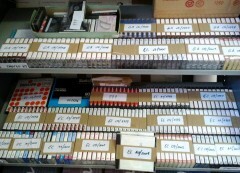 VIAA, the Flemish Institute for Archiving, wants to save as much audiovisual material as possible from ruin. 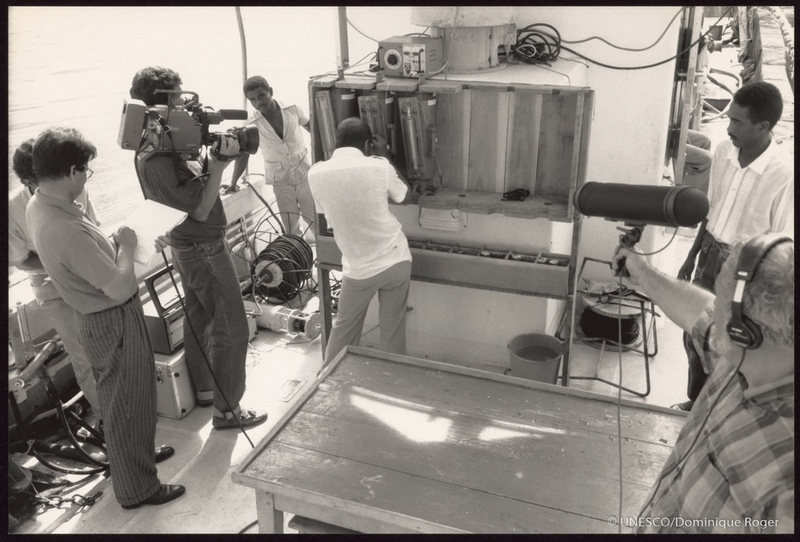 On World Day for Audiovisual Heritage, we are putting that mission in the spotlight. 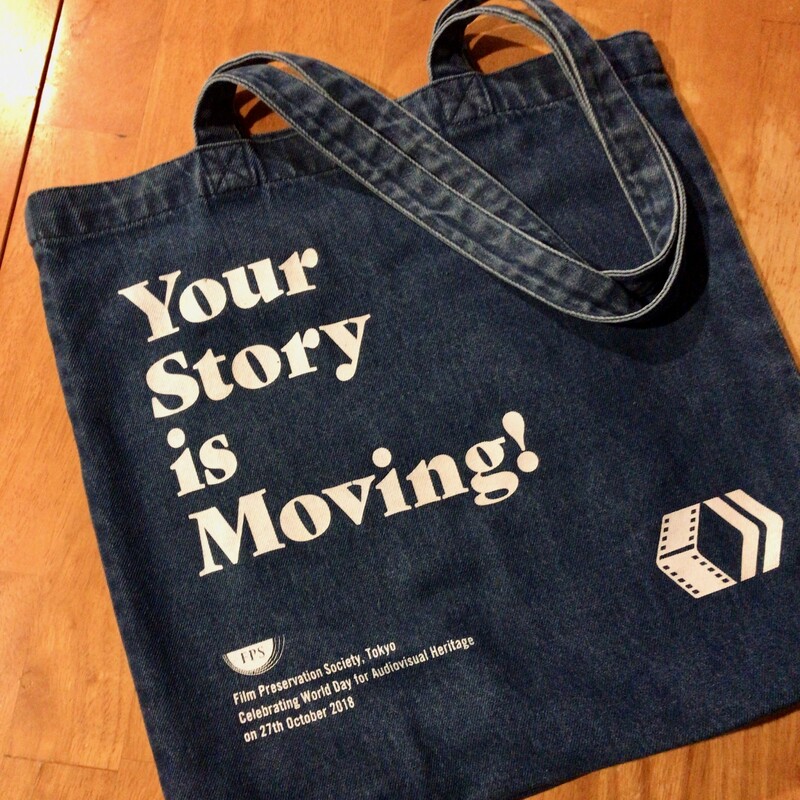 This year’s central theme is ‘Your story is moving’. We therefore want to help everyone with his or her story, by providing knowledge about their own piece of audiovisual heritage. 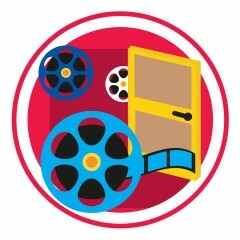 On www.knowyourcarrier.com, you can find out what kind of audiovisual carrier you possess by answering some specific questions, as an individual or as a professional. We will also help you determine whether your material has any heritage value and provide you with some tips regarding a possible digitisation. This way, no valuable heritage will get lost. VIAA’s operations focus on image and sound, preserved in Flemish heritage institutions, archives, museums and the media sector. That does not mean there are no gems to be found in the Flemish attics. With this tool, we also want to help the man on the street with his or her personal audiovisual archive. So dive into your attic and dig up those audio cassettes, vinyl plates or old wire coils! Explore our tool and discover the audiovisual treasure that you possess. Perhaps it has a scientific or historical significance? Or maybe it contains images of your beloved great-grandfather? Either way, it is worth looking into. Visit www.knowyourcarrier.com to learn how and where to digitise and preserve such carriers and do not let treasures get lost in the attic forever. To celebrate the world day for audiovisual heritage, with this year’s theme “Your Story Is Moving”, Bophana Audiovisual Resource Center presents Rithy Panh’s latest movie “Graves Without A Name”(2018, 115min, Khmer & French version with English subtitles). On this occasion, the Bophana Center also launches an online exhibition, called “Transmissions 2018”. It provides a variety of materials, such as films, photos and texts and deals with the happenings during the Khmer Rouge regime and the intergenerational dialogue between the Khmer Rouge survivors and youth. 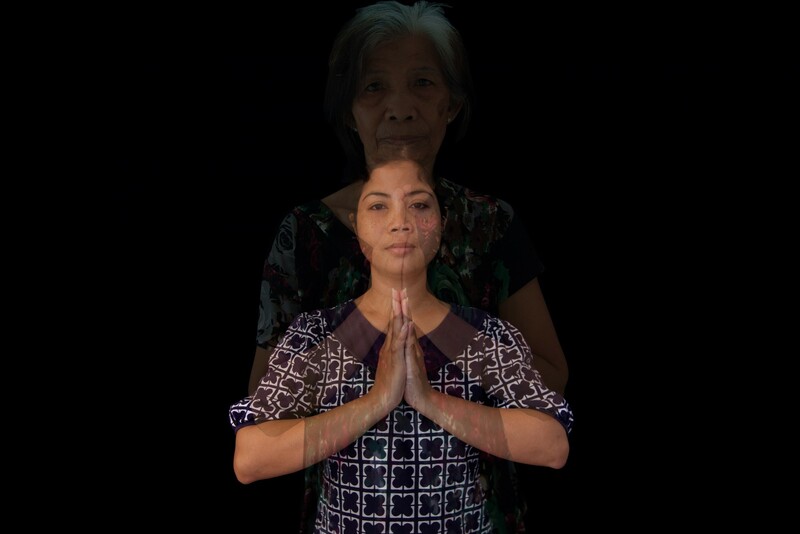 Through documenting and sharing the personal stories of the survivors, “Transmissions 2018” focuses on the importance of “acts of memory for Cambodian people to move forward”. En conmemoración del Día Mundial del Patrimonio Audiovisual, la Cineteca Nacional de Chile exhibirá la versión restaurada de Las alas del deseo (1987), de Wim Wenders. Copia que llega gracias a Goethe Institut. Será una función especial, con entrada liberada. Esta restauración digital se realizó a partir de los negativos originales, supervisados por el mismo Wim Wenders. y estuvo a cargo de la Fundación Wim Wenders con motivo de los 30 años de su estreno. Fue exhibida este año en el Festival de Cine de Berlín. Wenders pudo finalmente poner el contraste de imagen que siempre quiso para la película, pero que nunca pudo conseguir originalmente. La función se realizará el 27 de octubre, a las 19.30 horas, en la Sala de cine del Centro Cultural La Moneda. Supraphon is, historically, the most significant record company in the Czech Republic. The Supraphon brand name was derived from the name given to a type of modern electric Gramophone in the thirties. It was registered in 1932. The National Library of Technology in Prague will be signing a contract of cooperation with Supraphon. The main goal of this is to secure exclusive access to the Supraphon Audio Digital Archive from within the library. Registered users will be able to browse and listen to audio recordings, even on their own devices, over the library’s wifi network. Launching this new service serves as a strong example of cooperation between the private and state sectors, while also serving as our shared contribution to the World Day of Audiovisual Heritage at the same time. Updated information on this page (select your language: English, French, German, Spanish or Catalan). Good Day for Audiovisual Heritage! Mad scientist Professor Jakob ten Brinken succeeds in artificially inseminating a prostitute with the sperm of a murderer. Thus is born the troubled girl Alraune. As a grown young woman, Alraune falls in love with Frank, who ends up breaking off their relationship abruptly. Alraune gets revenge by ruining multiple admirers’ lives. 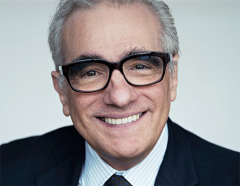 When Frank changes his mind and tries to wed his former lover, the drama takes its course. 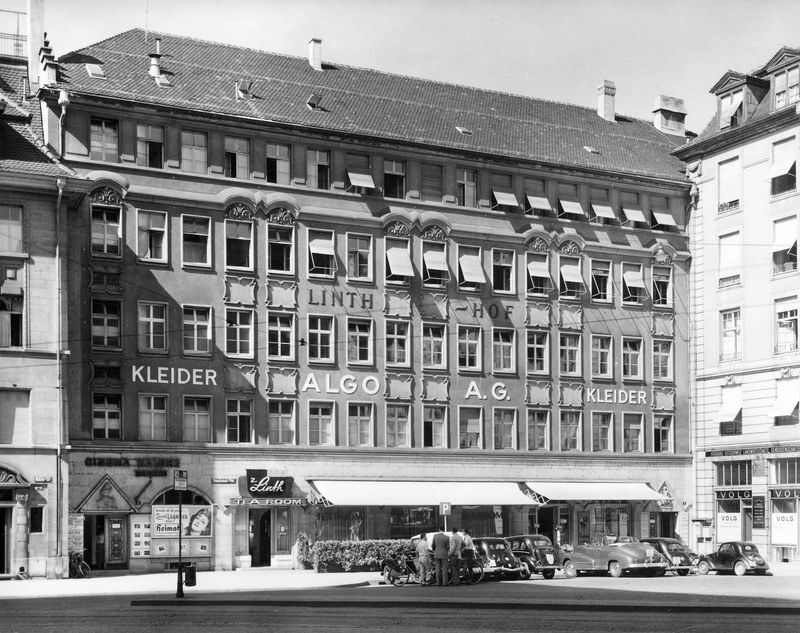 Deutsches Filminstitut – DIF digitises select films from Germany’s film heritage for screening in modern cinemas. 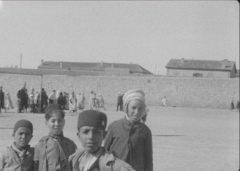 This film was digitised in 2017 in the scope of these efforts, with funding from the German Federal Government Commissioner for Culture and the Media. 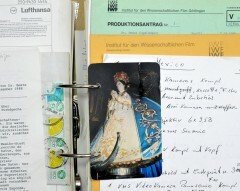 As part of its mission, Deutsches Filminstitut – DIF digitises select films from Germany’s film heritage in order to be able to screen them again in cinemas. In the scope of these efforts, the films VIELE KAMEN VORBEI and ALRAUNE were digitised in 2017 with funding from the German Federal Government Commissioner for Culture and the Media. Pewas manages to capture the microcosm of the German Autobahn by night in haunting images that invariably cast a spell over the viewer. Pour la Fête du Cinéma d’Animation, organisée chaque année en octobre par l’Association Française du Cinéma d’Animation, des affiches et photos d’exploitation de films d’animation français sont actuellement exposées à la Cinémathèque de Bourgogne, ainsi qu’une exposition créée à partir du dossier pédagogique du film La Moufle de Clémentine Robach sorti en 2014. - projections de films d’archives issus des collections de la Cinémathèque de Bourgogne. En amont de cette journée, la Cinémathèque de Bourgogne vous propose ce mercredi 24 octobre à 22h de découvrir le ciné-concert avec Voyages qui utilise des films amateurs issus de ses collections. 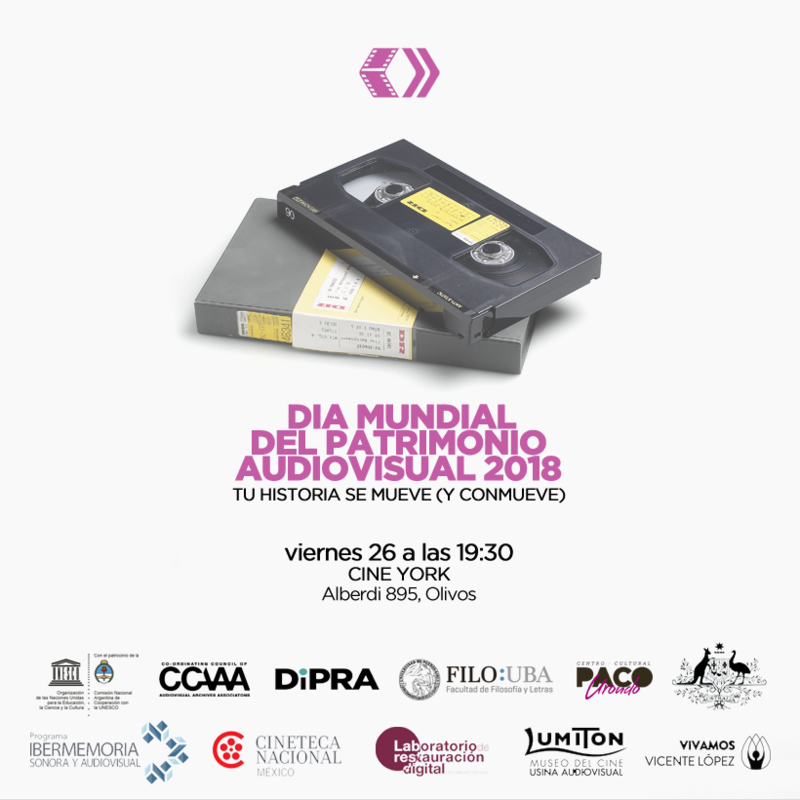 La Cineteca Nacional de México conmemora este año el Día Mundial del Patrimonio Audiovisual con dos días de proyecciones: el jueves 25 presentaremos una serie de cortos históricos y al día siguiente, una película experimental independiente de 1969. El jueves 25 se mostrarán varios cortos de 1914 a 1968. Este material de nuestros archivos incluye el “Voyage sur la vallée de la Seine à bord d’un hydroaéroplane Maurice Farman” de 1914, de los hermanos Pathé de Francia; un fragmento de la película “Alma de América” de 1931, la quema de objetos religiosos de la Colección Garrido Canabal y el desfile deportivo del 20 de noviembre 1939 filmado en pleno fervor cardenista, que cuenta con la fotografía de Manuel Álvarez Bravo (cuya obra forma parte ya de Memoria del Mundo Unesco) y Agustín P. Delgado. También se proyectarán los cortos documentales “La Ciudad de los deportes”, y “De Indianilla a Palacio”, en el cual vemos al presidente Miguel Alemán manejando un tranvía en pleno centro de la ciudad de México, seguido de dos divertidos cortos sobre las fiestas de la primavera y sus reinas en 1950. “La azotea” es un corto de Jorge Durán Chávez de 1953, sobre la vida en las azoteas de la ciudad. En seguida veremos un número completo del Noticiero Méxicano de 1965, un interesante ejemplo de lo que el público veía entonces en los cines antes de la atracción principal. Y, para cerrar, “Olimpia 68” que muestra el proceso creativo del diseño gráfico empleado durante la Olimpiada de México en 1968. El viernes 26 se proyectará el largometraje experimental "Anticlímax" de Gelsen Gas de 1969, con guion de Luis Urías, fotografía de Rafael Corkidi y música de Jimmie Nicol y Gelsen Gas. Se trata de una producción independiente llena de contrastantes planos geométricos. Las locaciones incluyen, entre otras, la casa del escultor Feliciano Bejar, el entonces muy moderno edificio de Celanese Mexicana del arquitecto Ricardo Legorreta, y la Ruta de la Amistad, serie de esculturas creadas ex profeso para la Olimpiada en México. 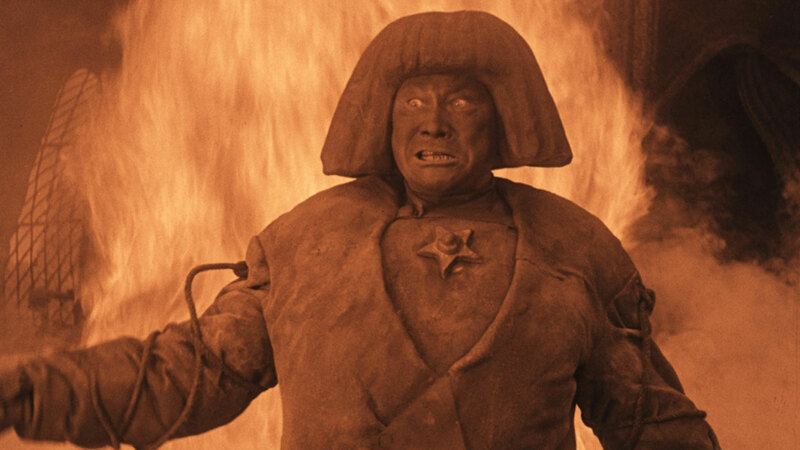 Fondazione Cineteca Italiana will celebrate the Unesco WDAH on Sunday 28th October at 5 pm, when our cinema Spazio Oberdan will host the exclusive milanese premiere of ‘Der Golem, wie er in die Welt kam’ (1920, 76’) by P. Wegener and C. Boese, with live piano accompaniment by Francesca Badalini. From SAMLM we take advantage of the celebration of the World Audiovisual Heritage Day to publicize the audiovisual documentation that we have deposited in our facilities and to explain the most appropriate techniques and conditions to preserve all this heritage. This year, the screening, which will take place on Friday, October 26 at 8 pm at the Teatre de Lloret, is entitled: "Lloret of the seventies, under the eyes of Miquel Juanola and Montse Sagaró". Courage and Communities project celebrates the suffrage movement across London. 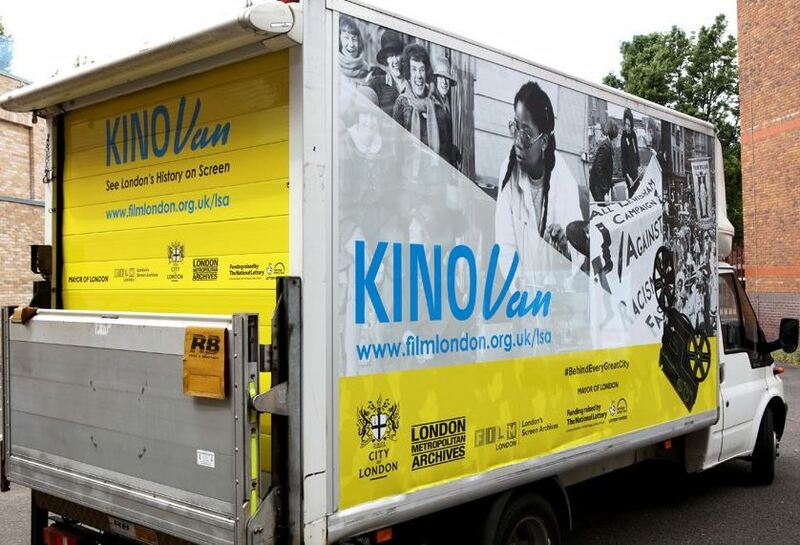 As part of the Mayor’s #behindeverygreatcity campaign and generously funded by the Heritage Lottery Fund, the project involves exciting cultural partners including Film London, London Metropolitan Archives, Into Film, Museum of London, Royal Albert Hall and the BFI. The project commemorates The Representation of the People Act 1918, which gave some women in the UK the vote for the first time. London was at the forefront of the historic suffragette movement, helping to change equality, rights and citizenship for women around the world. Join us for the finale outdoor screening of this inspiring project at BFI Southbank on Saturday 27 October as part of the World Day for Audiovisual Heritage celebrations. 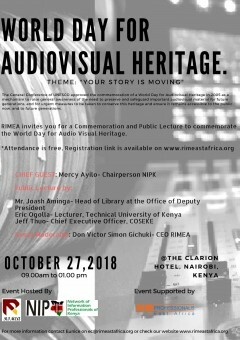 This years World day for Audio Visual Heritage falls on the 27th October 2017. 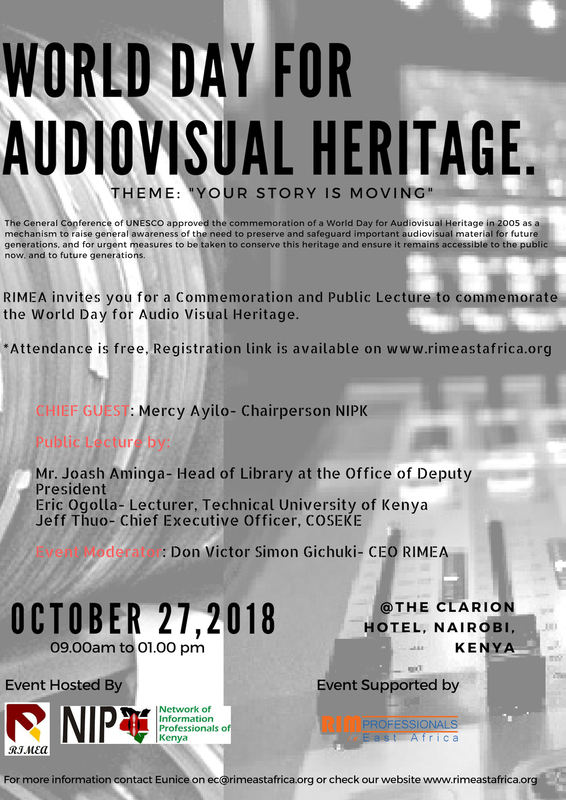 As part of our activities, Records and Information Management East Africa Limited are proud to host this years Celebrations for the World Day for Audio Visual Heritage in Partnership with Network for Information Professionals Kenya (NIPK) at the Clarion Hotel, Nairobi, Kenya. The Theme for the day is: "Your Story is Moving". Closing film to the 9th Athens Avant-Garde Film Festival (17-29/10/2018), organised by the Greek Film Archive, is the classic, black and white film Bell’ Antonio (Italy-France, 1960) by Mauro Bolognini, with Marcello Mastroianni and Claudia Cardinale, in a script by Pier Paolo Pasolini. Restored in 4K in 2017 by Compass Film Srl and Cinématographique Lyre SaS, with the support of CNC – Centre national du cinéma et de l’image animée, Istituto Luce – Cinecittà, Centro Mauro Bolognini and Cassa di Risparmio di Pistoia e Pescia at Studio Cine Srl and Hiventy laboratories from the original negative. In the shadow of the major Hollywood studios—Paramount, Metro-Goldwyn-Mayer, 20th Century Fox—numerous independent “Poverty Row” studios produced what were called “B” films, which ran at best as the second feature behind the major studios’ “A” films, whether westerns, crime dramas, horror or comedies. 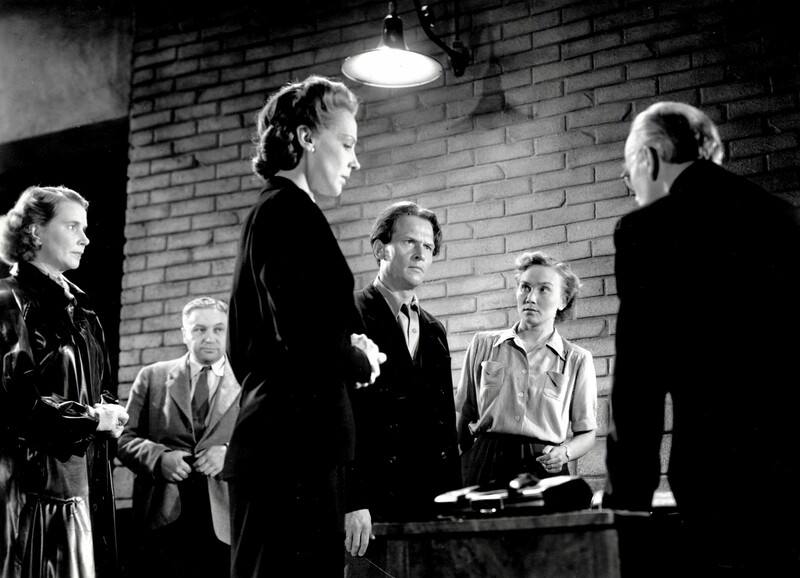 Many of these independents were housed in rental studios off Gower Street in Los Angeles, often referred to as “Gower Gulch.” Despite their exceedingly low budgets, resulting in often cheesy sets and under-par acting, the Poverty Row studios had a surprising degree of freedom to tackle controversial subject matter that the majors would not have touched, such as venereal disease, the psychology of kidnap victims and quackery in the medical profession. The lack of budget also gave creative film directors, like Edgar G. Ulmer and Lowell Sherman, the opportunity to turn minimal resources into expressive devices, developing a kind of visual shorthand that looks very different than a big-budget MGM film. 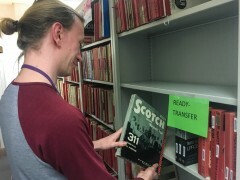 UCLA Film & Television Archive is dedicated to preserving films of all kinds, from the biggest-budget extravaganzas to the lowest-budget exploitation titles. With the major entertainment companies now preserving their own work, the Archive has moved increasingly towards preserving independent and Poverty Row titles, many of which are no longer copyrighted. These “orphan films” are however worthy of restoration and exhibition. They visualize many of the repressed or forbidden themes that preoccupy the nether regions of the American psyche. This series is an abridged version of the Museum of Modern Art’s major retrospective of Poverty Row films preserved by the Archive. 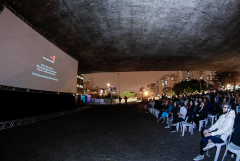 In a partnership with the São Paulo International Film Festival, the most important festival held in our country, the Cinemateca Brasileira will present an open-air film programming (free of charge), in the São Paulo Art Museum - MASP outdoor area, located in one of the most dynamic avenue in our city. 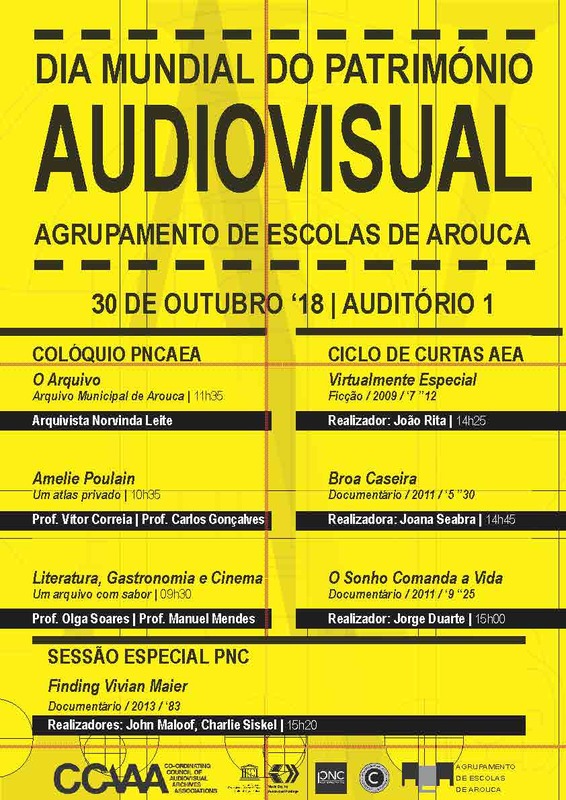 From 23rd to 27th October, four representative films of the Brazilian audiovisual diversity will be screened: "As canções" (2011), directed by Eduardo Coutinho; "Matar ou correr" (1954), by Carlos Manga; "Uma vida em segredo" (2001), by Suzana Amaral, and "Ópera do Malandro" (1986), directed by Ruy Guerra – this last film in a new 35mm print, specially made by the Cinemateca for the celebration. In addition, on the 20th October, the Cinemateca Brasileira will celebrate another important date: the Home Movie Day, through a programming that highlights amateur films’ cultural, historical an artistic merit. 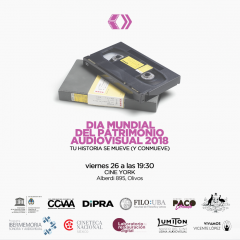 People are being invited to bring their S8, 8mm, 16mm film formats or their VHS, Digital 8, Hi 8 and Mini-DV tapes, that will be analysed and prepared by the Cinemateca technicians for a public exhibition in the institution's. 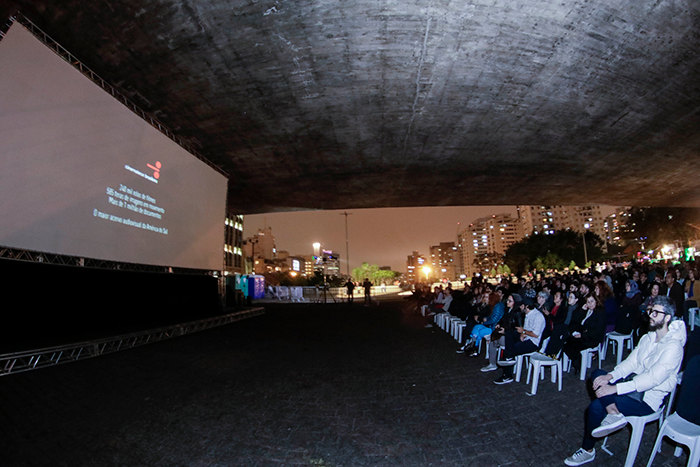 With these celebratory events, the Cinemateca Brasileira hopes to enlighten the importance of the audiovisual preservation – amateur and home movie films included. Celebrating the World Day for Audiovisual Heritage, in which the Recommendation for the Safeguarding and Conservation of Moving Pictures was adopted by UNESCO in the General Assembly in Belgrade more than three decades ago (1980), Cinemateca Portuguesa-Museu do Cinema proposes a special session with the international version of C'ERA UNA VOLTA IL WEST / ONCE UPON A TIME IN THE WEST to be displayed in digital format, from a restoration presented in this year's edition at Il Cinema Ritrovato Festival, organized by Cineteca di Bologna. Two Yevgeni Bauer classics in a film concert by Mauri Saarikoski (violin) and Marko Puro (piano): The Dying Swan (Umirajushtshi lebed, 1916), and For Happiness (Za schastyem, 1917), preceded by The Grasshopper and the Ant (Strekoza i muravei, Wladyslaw Starewicz, 1913). The Yevgeni Bauer prints are from Gosfilmofond and the Starewicz animation is preserved from a vintage Finnish release print. The playlist consists of contemporary Russian masterpieces by Tchaikovsky, Rachmaninov, and others. 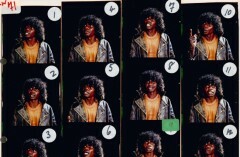 A collaborative project between the National Film and Sound Archive and the National Portrait Gallery, Starstruck: Australian Movie Portraits reveals never-before-seen stories of Australian cinema. 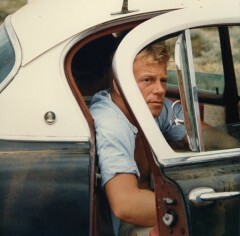 Through photographic portraits, candid behind-the-scenes shots, rare film posters, casting books and original costumes, Starstruck celebrates the past and present of Australian film—including watershed moments in cinema and iconic visions of Australian life—and also offers a glimpse into the experiences of the actors and crew. The exhibition explores how cinema portraiture can create a bridge between the magic of a movie’s fictional worlds and the realities of filmmaking. A National Film and Sound Archive of Australia and National Portrait Gallery exhibition supported by the National Collecting Institutions Touring and Outreach Program, presented by Samstag Museum of Art for the 2018 Adelaide Film Festival. Starstruck: Australian Movie Portraits is open at Samstag Museum of Art in Adelaide until Friday 30 November 2018. 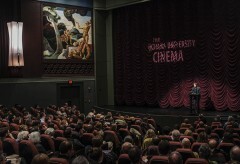 A series of talks and screenings of NFSA Restores titles at Mercury Cinema complements the exhibition. 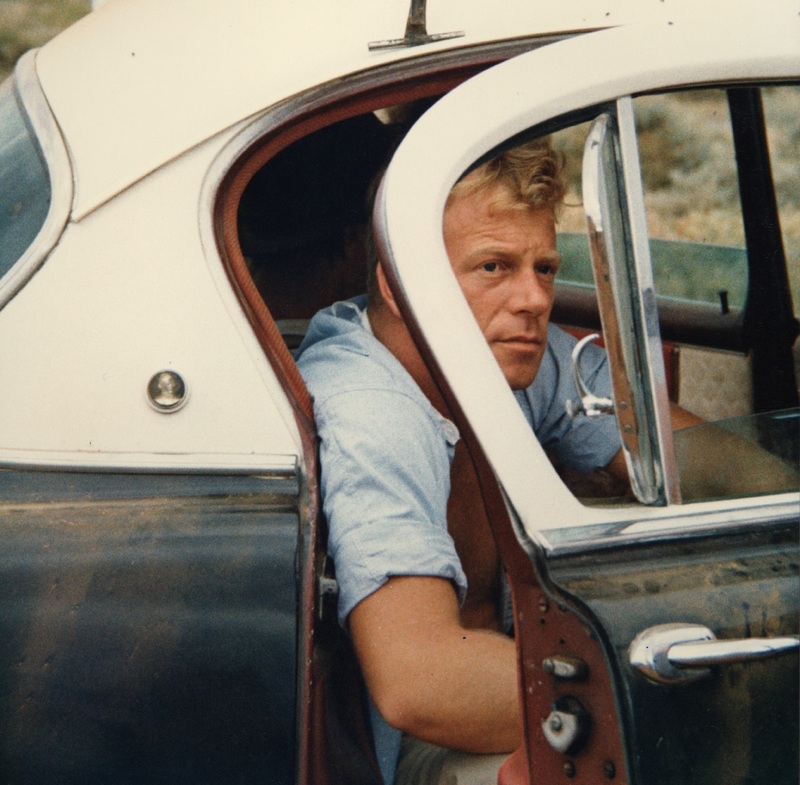 Canberra premiere of the latest digital restoration by NFSA Restores: Sunday Too Far Away. This story of a shearer’s strike in the 1950s stands as a landmark film in the re-emergence of Australian film production in the 1970s. The first feature produced by Matt Carroll and Gil Brealey for the newly formed South Australian Film Corporation, it sold internationally after it was invited into the prestigious Directors’ Fortnight at the Cannes Film Festival. NFSA Restores is an exciting program to digitise, restore and preserve, at the highest archival standards, classic and cult Australian films so they can be seen on the big screen in today’s digital cinemas. This year the Slovenian Cinematheque and Slavko Kačunko (University of Copenhagen), who will present a 70-minutes video program by distinguished German video artist Marcel Odenbach, join us at the celebration. Marcel Odenbach (born 1953) is one of the pioneers of video art in Germany and his works are remarkable introspections on the German society. The selection of works combines a retrospective orientation with an attempt to cover the major thematic emphases in the artist’s oeuvre. Additionally, and very briefly, also the recently published Theories of Video Art (3rd and 4th issue of EVA – Edition Video Art, Logos Verlag Berlin 2018) will be introduced. This comprehensive two volume-anthology offers an invaluable source for an interdisciplinary study of video, media- and contemporary art as well as the accompanying theories. Oleksandr Dovzhenko National Centre will present program of home and amateur videos shot prior to 1997 year in different format as part of “VHS-days” that will take place on October 27, and November 24. 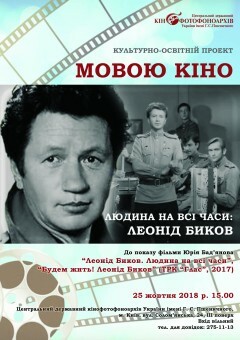 Video in different genres will be screened and discussed with their authors - family chronicles, clips illustrated with amateur videos, genre films, among others - comedies and dramas shot by students and workers in amateur cinema clubs organized at the factories, institutes and other organizations in soviet and post-soviet times. 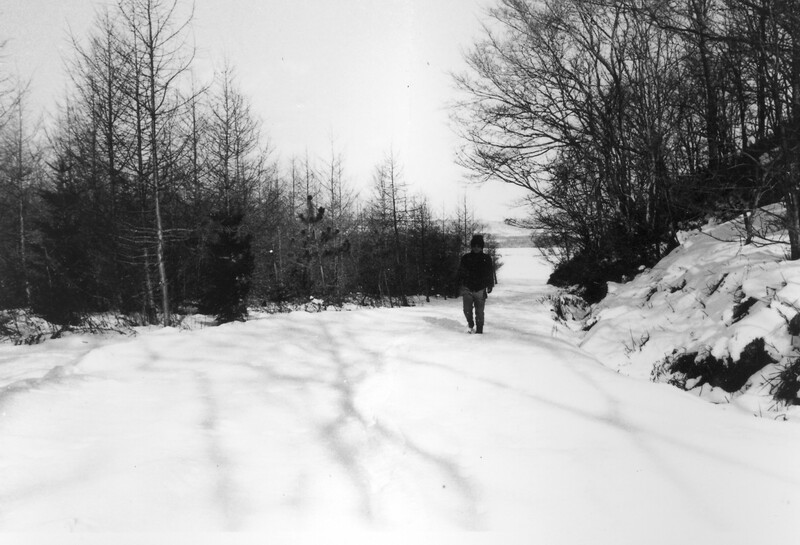 Home and so cold “vernacular” video has been integrated as an essential part of contemporary visual archives. Dovzhenko Centre announced open-call for collecting and free digitization of video materials from private and cine club’s archives. These true-to-life episodes from life of a single family, a club or a factory will soon become shards of collective memory of a generation. These film footages is not only spellbinding performance for contemporary audience, but also contain valuable and unique material for historians, researches of culture, directors and artists. Outdoor Screening: "Emperor Zhengde’s Night Visit to the Dragon and Phoenix Inn"
Celebrating UNESCO's "World Day for Audiovisual Heritage"
In celebration of UNESCO's "World Day for Audiovisual Heritage", the Hong Kong Film Archive (HKFA) is presenting a cherished film from its collection, Emperor Zhengde’s Night Visit to the Dragon and Phoenix Inn (1958). In 1994, the HKFA acquired the colour negatives, a black-and-white print and other related materials of the film from a distribution company. Unfortunately, part of the colour negatives had been damaged and the original soundtrack was beyond repair. Thanks to the continual improvement in digital technology, the HKFA is finally able to extract the sound from the black-and-white print and some edited-out film, combining the sound file with the digitised image from the colour negatives to restore the film to a state closer to the original version. Utilising digital restoration techniques, jittering in the original picture, scratches and surface dirt were reduced. Colour correction and noise reduction were also performed. 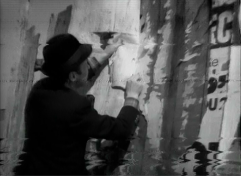 Black-and-white footage of scenes not found in the colour negatives were spliced in to compile a more complete 108-minute version. 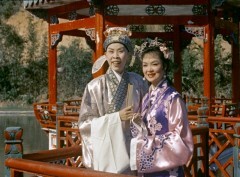 The film was originally shot in Eastmancolor, a technique not yet popular in Hong Kong at the time, but the hues are bright and eye-catching, realised by Joseph Sunn Jue (aka Chiu Shu-sun), producer, cinematographer and colour technique consultant. This screening is an attempt of the HKFA to introduce Emperor Zhengde’s Night Visit to the Dragon and Phoenix Inn to the audience in its glorious original magnificence. 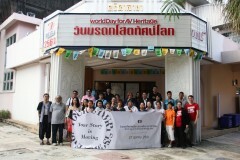 Eye celebrates World Heritage Day with stories based on our rich collection of films and film apparatus. Admission to Eye’s permanent exhibition in the Panorama will be free this afternoon. The permanent exhibition will be enhanced for this day only by unique pre-cinematic devices. Eye's new robot filmmaker JanBot will be present to meet the visitors. The programme also features a few special attractions and a treasure hunt for children. For detailed description please see the Dutch language site above. Presentation and public screening based on the latest project of our film archive: the restoration of the animation films of Joaquín Pérez Arroyo and his children. Self-taught animators, they worked in València during the 40s and 50s. 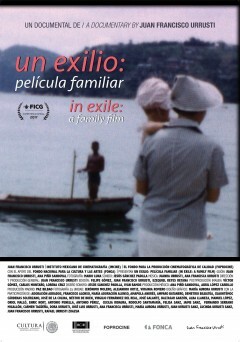 In a first period, their short films were produced by CIFESA, the most outstanding Spanish company at the time. Later, when Franco’s newsreels (NO-DO) replaced short films at film showings, Pérez Arroyo and his children went on working for the toy industry, creating films in 9.5 mm and 17.5 mm for the toy projectors of the time. A selection of these films, all of them brief and starring their emblematic characters, will be screened with live piano music. 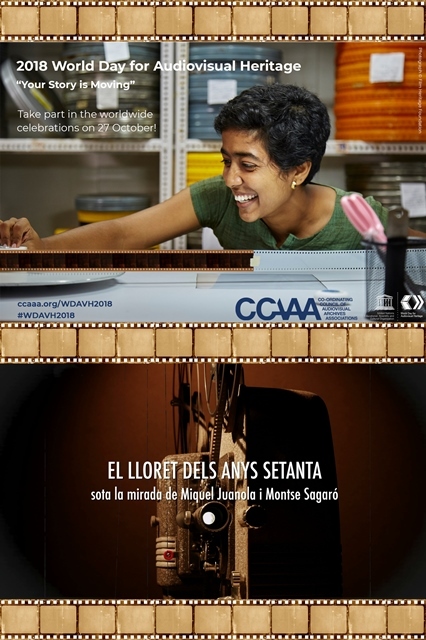 Isabel Bosch, in charge of the restauration, and Raul González Monaj, professor and researcher, will also present the website that La Filmoteca de València and the Universidad Politécnica de València will dedicate to the work of the Pérez Arroyo family. 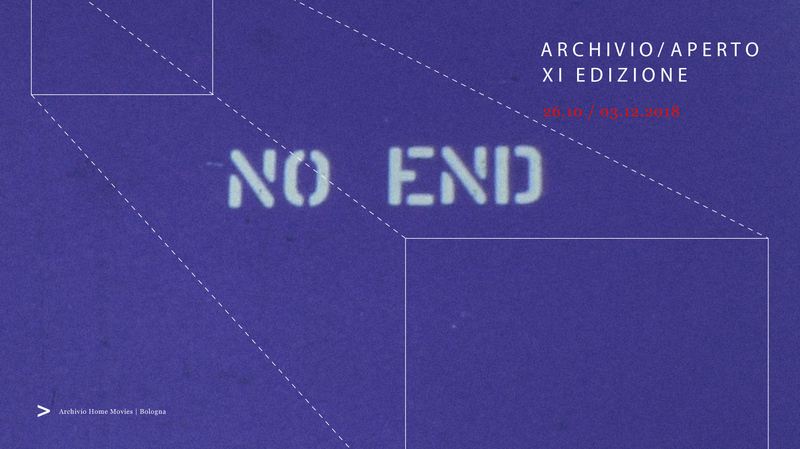 Inma Trull, Head of Acquisitions, and Chus Piqueras, preservation technician, will introduce a compilation of amateur images filmed in 8 mm, Super 8 mm and 9.5 mm, digitized and preserved by our archive. Witnesses of private and public life, these films are invaluable documents for the conservation of Valencian people’s collective memory. Join us as we celebrate UNESCO’s World Day for Audiovisual Heritage 2018 with a free screening of newly preserved Soundies & Musical Short films from the University of Toronto Media Commons Archives. 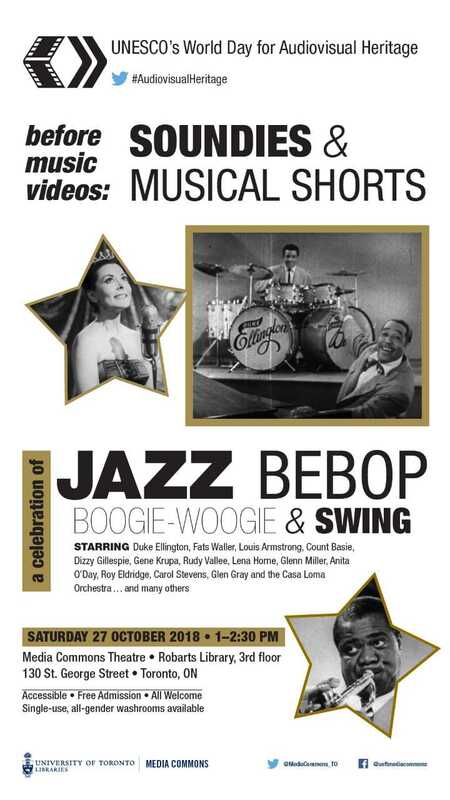 The screening will feature musical performances by the great Duke Ellington, Glenn Miller, Louis Armstrong, Lena Horne, Dizzy Gillespie, Lionel Hampton, Gene Krupa, and Count Basie. 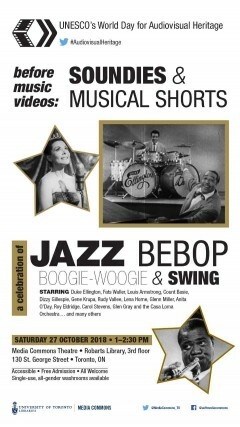 As well as, also highlighting some equally talented, but lesser known performers such as Carol Stevens, Glen Gray and the Casa Loma Orchestra, Cootie Williams, Larry Clinton, Anita O’Day, Coleman Hawkins, Roy Eldridge, Louis Jordan, Rudy Vallee, Dewy Brown, The Delta Rhythm Boys, Laurel Watson, Apus & Estrelita, Jimmie Lunceford, and the one and only Philharmonicas. Media Commons is a department of the University of Toronto Libraries and is currently the largest repository for both archival and contemporary audio-visual research resources in any Canadian university. The Media Archives has a collection of over 100 unique fonds/collections dating from the 1870's to present. Categories include: Film Production, Radio & Television Production, Music Production, Photography, Animation, and Advertising. 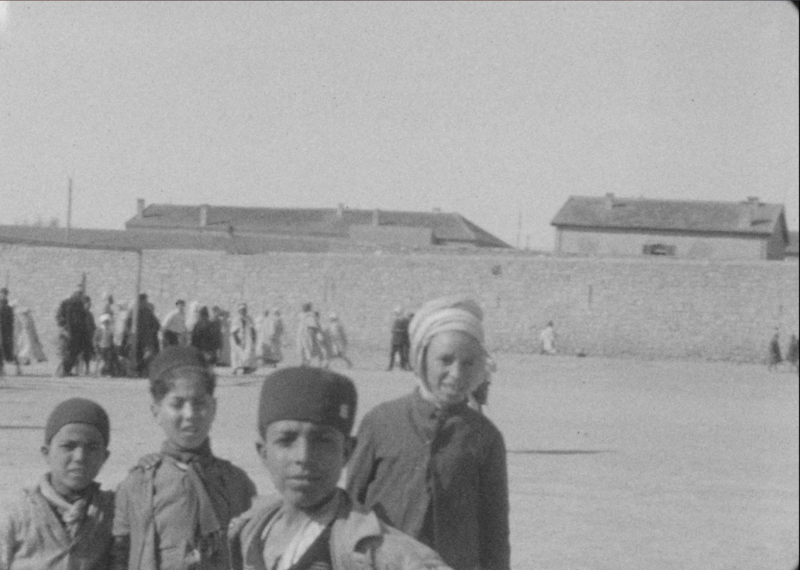 Bundesarchiv and Zeughauskino are happy to present rare filmclips from the era of First World War which have been found in Archives in France/Paris and Germany/Berlin as well as an experimental film by Bill Morrisson. The combination of such terms like war and theater or bombs and stage seems strange at first sight. But they have been omnipresent during the period of First World War. Soldiers and male prisoners played female roles in so called Front- and Prisoners' Varieté programmes. In an isolated society of men within the soldiers' camps and prisoners' barracks these 'actresses' became admired stars. It has to be considered not only as mere amusement but really as a projection screen for sexual phantasies. An introduction will be given. The breathtaking experimental collage "Beyond zero: 1914-1918" by Bill Morrisson follows as part two of that special programme. The film uses the optical effects arrisen through the chemical decay of early nitrate film to reflect about the impermanence of life and film material. The films will be musically accompanied by Kronos Quartett and Eunice Martins on the piano. Teho Teardo presents "Music for Wilder Mann"
Composer Teho Teardo’s music attracts and is attracted by other art forms, creating in Music for Wilder Mann, a novel relationship between traditional and electronic musical instruments. Here he expands his soundtrack repertory for cinema and theater by entering into dialogue with Charles Fréger’s photographs, published in the book Wilder Mann: the Image of the Savage. Music for Wilder Mann offers the experience of collapsing into a chaos of emotion, sinking with the sounds in dialogue with the images. The Wilder Mann images, the startling photographs of humanized beasts collected in Fréger’s book, which has become a classic in its own right, evoke an uneasiness accompanied by Teardo’s music. Fear and fright augment our curiosity to keep looking at these futuroid beings from our dark past, their animal skins and teeth, horns and antlers, whatever the ferocious feature of bears and boars, monsters and demons that sets off terror. The focus of the collaboration between Teardo and Fréger was to explore by means of music and photography the savage, an angel or a demon embodying desires and defects. For there is a need to discover the roots of our hopes and concerns that are intimately tied to our primitive, archaic instincts, which are still within us, barely audible above the noise of modern technology, the barrage of words and images, and the waves of data overwhelming us. An anthropological exploration of our need for the savage in us. The photographs illustrate a disturbing, yet still recognizable throwback to an ancestral era far from today’s reality. This is not nostalgia for the past, however: the Wilder Mann figures, these futuroid ancestors, are pagan folk; the electronics and the strings are not bothered with the temporal passage from the dawn of time to the present. The music is free to be what it wants to be anywhere; it is an emotional account from elsewhere, an atavic remnant that resonates between the synthesizers and the strings. The Music for Wilder Mann concert is a special event presented with the instrumentation originally conceived for the entire album: two cellos, a viol, and Teardo’s electronic instruments seek to enter into dialogue with a different kind of image, Charles Fréger’s extraordinary photographs. There is a musical piece for each photograph of a towering figure, a symbol of our innermost fears, whose meaning varies with our gaze. At a certain point in the concert, thirty percussionists strike cymbals and gongs, sending the sound frequencies upwards to the heavens. Teho Teardo – baritone guitar, electronics; Laura Bisceglia, Giovanna Famulari – cello; Ambra Chiara Michelangeli – viol. 9 p.m. Admission with Museum ticket. 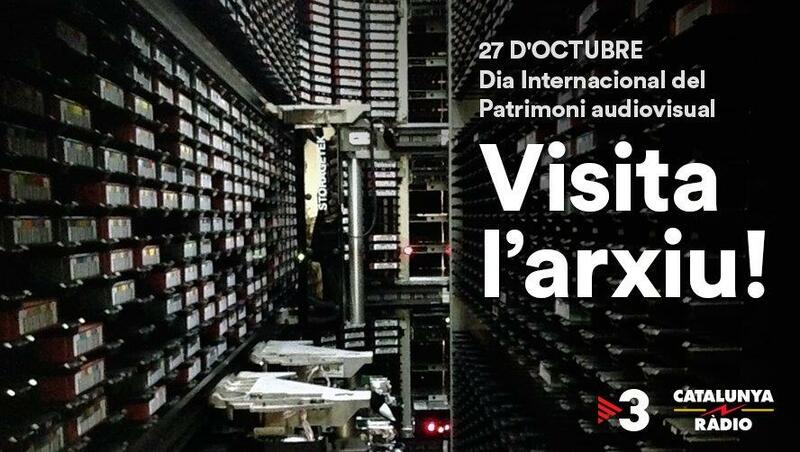 ULTRAcinema, en colaboración con el FARO Aragón, el IMCINE y el Centro de Capacitación Cinematográfica presentará un par de programas para unirse a la celebración. México, 2013 / Documental, 69 min. México, 2017 / Documental 124 min. On October 25–28, 2018 the third installment of the film heritage festival “Film:ReStored” will take place at the Filmhaus on Potsdamer Platz, a special event organized by the Deutsche Kinemathek for the Kinematheksverbund (association of German cinematheques). Digitally restored films will be screened across four days, in part as premieres. Lectures and workshop reports dedicate themselves to questions about the digitalization of film heritage. 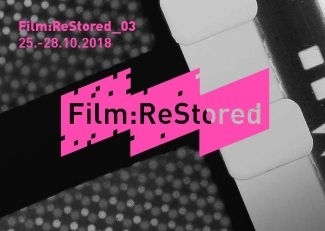 The third edition of Film:ReStored will address the interplay of film and television archives within the traditions of dealing with film heritage. Without the contributions of television, German film history since the 1960s would look considerably different. Much of what became possible in New German Cinema is also owed to the engagement of individual TV editors, who have continuously supported such works over decades and who have had an influence on both careers and developments in the genre. It seems all the more necessary to consider television and film history together and to develop cooperative strategies to bring dormant treasures back to life on screen. Some of these will be shown again for the first time as part of the Film:ReStored_03 program. Course "Management of Audiovisual Heritage"
In the context of the academic activities of the 30th week of the Faculty of Information Sciences of the UASLP, from 10 to 12 of this month, in commemoration of World Audiovisual Heritage Day, is given the course "Management of Audiovisual Heritage" directed to undergraduated students of the degree in Management Information and Documentary and Archival Management. Visit to the Museum of Cinema and presentation of the magic phantasmagoria lantern from the Institute of Secondary Education in Girona. 1. Guided visit to the magic phantasmagoria lantern. It was acquired in 1849 by the Institute of Secondary Education in Girona. This apparatus was used by the institute for almost 30 years at its classrooms. 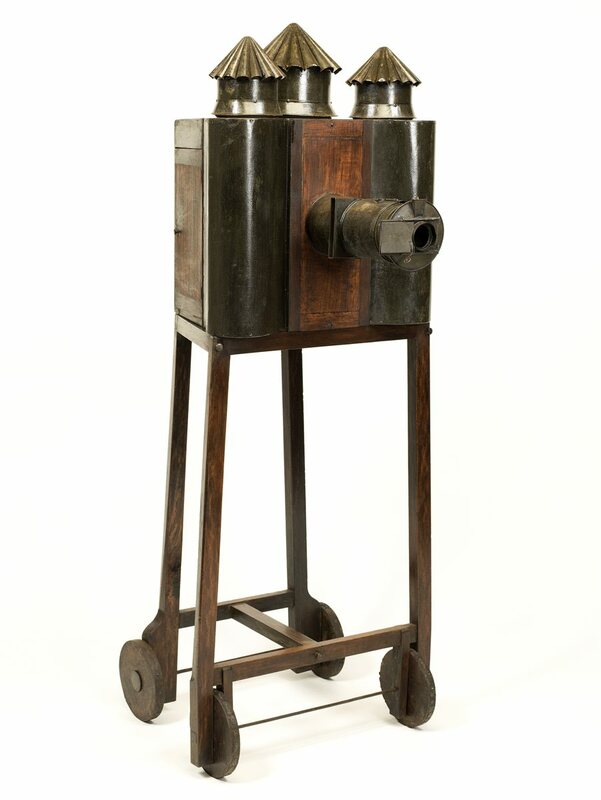 Accompanied by the director of the Museum, Jordi Pons, and the curator, Montse Puigdevall, we will be able to see original lantern plates related to this historic projector. 2. Paper by Daniel Pitarch: "Phantasmagoria and education: audiovisual culture in Girona in the nineteenth century". After learning about the magic phantasmagoria lantern, we will focus on the audiovisual culture of the nineteenth century. The speaker will explain the history of this object (how it was acquired, what were its possibilities, etc.) and the relationship between audiovisual and education in the nineteenth century. 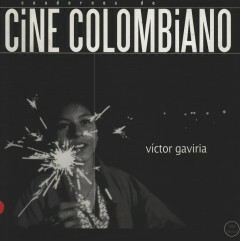 Proyección en el marco del día mundial del patrimonio audiovisual de la reconocida cinta colombiana La vendedora de rosas dirigida por Víctor Gaviria. 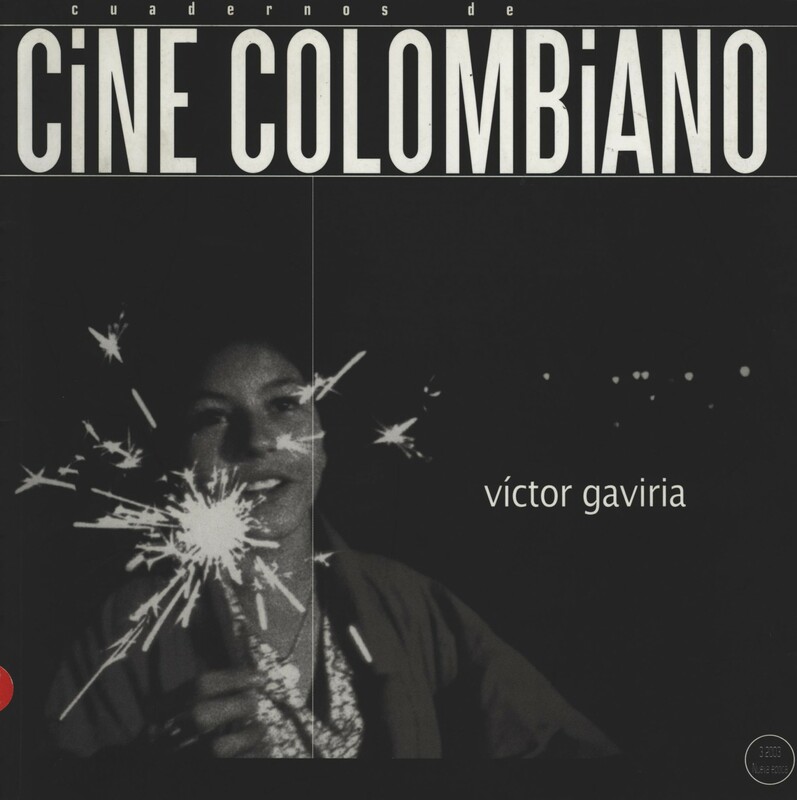 Película que en 2018 cumple 20 años de su estreno mundial en Colombia y de su participación en el Festival Internacional de Cine de Cannes. Sinopsis: Mónica tiene 13 años y ya se ha rebelado contra todo. Ha creado su propio mundo en la calle, donde lucha con coraje para defender lo poco que tiene: sus amigas, tan niñas como ella; su novio, que vende droga, y su dignidad y su orgullo que no le hace concesiones a nadie. En la noche de Navidad¸ como todas las noches¸ vende rosas para ganarse la vida¸ y para comprarse el sueño de una fiesta con pólvora¸ estrenar ropa¸ y salir con su novio. Pero la vida le depara una nueva cita con la soledad¸ la pobreza¸ la droga y la muerte. Mónica es la otra cara de una ciudad intensa y cruel como Medellín¸ como la de cualquier ciudad en donde los niños de la calle no tienen lugar en este mundo¸ en el que apenas viven el tiempo inútil de su inexistencia. Está película hace parte de la muestra Un mundo sin adultos, una invitación a volver al mundo de la infancia y al final de los tiempos. Journées "PEDAGOGIE DE LA CREATION ARTISTIQUE. SOURCES, VALORISATIONS, HISTOIRE ?" Conférence de Lise Facchin ((cheffe de projet numérisation et conservation, PSL-Explore) sur la mise en valeur numérique des fonds audiovisuels de trois écoles d'art, à des fins de sauvegarde et de recherche. La Fémis a inauguré en 2013 « Filmographies », un programme de création d’archives orales autour de la mémoire de grands professionnels du cinéma. Chaque année, les étudiants d’un département réalisent un entretien approfondi avec un grand professionnel du cinéma, qui est ensuite déposé à la Cinémathèque française et consultable à la Bibliothèque du film. Ces documents audiovisuels sont valorisés dans le cadre de la plateforme PSL-Explore. 15h15 : Entretien avec Pierre-William Glenn (directeur de la photographie, réalisateur, ancien élève de l’IDHEC, co-directeur du départment Image de la Fémis). Many Swiss Institutions will open their doors for Audiovisual World Day Heritage. Around the 27th of October, conferences, screenings, workshops, exhibitions and a Home Movie Day will be offered throughout Switzerland. The restored version of Friedrich Wilhelm Murnaus DER LETZTE MANN will be shown with musical accompaniment by Pierre-Yves Martel on Viola da Gamba and Carl Ludwig Hübsch on Tuba. With a lecture by Daniel Raboldt. The restored version of Friedrich Wilhelm Murnaus DER LETZTE MANN will be accompanied by Canadian Pierre-Yves Martel on Viola da Gamba and Carl Ludwig Hübsch on Tuba. With a lecture by Daniel Raboldt. 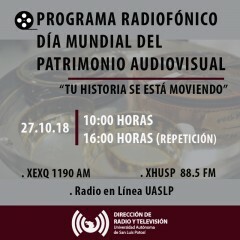 En el marco del Día Mundial del Patrimonio Audiovisual, el Instituto de Investigaciones Bibliotecológicas y de la Información de la UNAM ha invitado a destacados investigadores y responsables de fonotecas, archivos de radio y televisión, archivos sonoros de centros de investigación, archivos artísticos, así como a responsables de proyectos de preservación digital, para intercambiar conocimientos y aportar soluciones en relación con los principales problemas que afronta la preservación digital de colecciones digitalizadas y de origen digital en las universidades, instituciones públicas y medios de comunicación. Con ello, se busca contribuir en el diseño de estrategias y planes de colaboración entre las diferentes instituciones responsables de la salvaguarda de esta herencia documental. Marcel Odenbach is one of the most well-established and internationally known German video artists. In the 1970s, they formed the producer group ATV. Odenbach's works paradigmatically criticize the specific conditions of the German society for which he usually finds literary titles referring to puns or traditional sayings. Odenbach was born in 1953 in Cologne, Germany, where he studied architecture, art history and semiotics between 1974–79. In the late 1970s, he started using video work, tapes, installations, performances and drawings to probe the cultural identity of his native Germany. His ambivalence to cultural history shows in works such as "Make a Fist in the Pocket", a German expression for hiding one's rage. Odenbach was a professor of media art at the Karlsruhe University of Arts and Design between 1992–98. He now lives and works in Cologne and is the professor for film and video art at the Kunstakademie Düsseldorf since 2010. 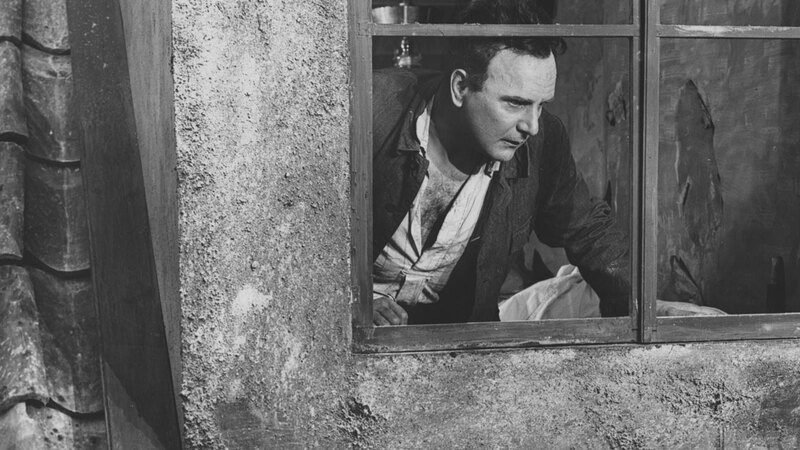 Beyond its obvious cultural significance as the only classic film noir directed by a woman, The Hitch-Hiker is perhaps better remembered as one of the most nightmarish movies of the 1950s. Inspired by the true-life murder spree of Billy Cook, The Hitch-Hiker is the tension-laden saga of two men on a camping trip held captive by a homicidal drifter, who forces them at gunpoint to embark on a grim joyride across the Mexican desert. Jason Foster is a dying and wealthy old man, who distrusts his visiting family members, convinced they are only interested in securing an inheritance. He demands his relatives each wear grotesque Mardi Gras masks which reveal their true personalities. Originally aired on March 20, 1964, The Masks was the first and only episode of the original The Twilight Zone series to be directed by a woman in the show’s 156-episode history. 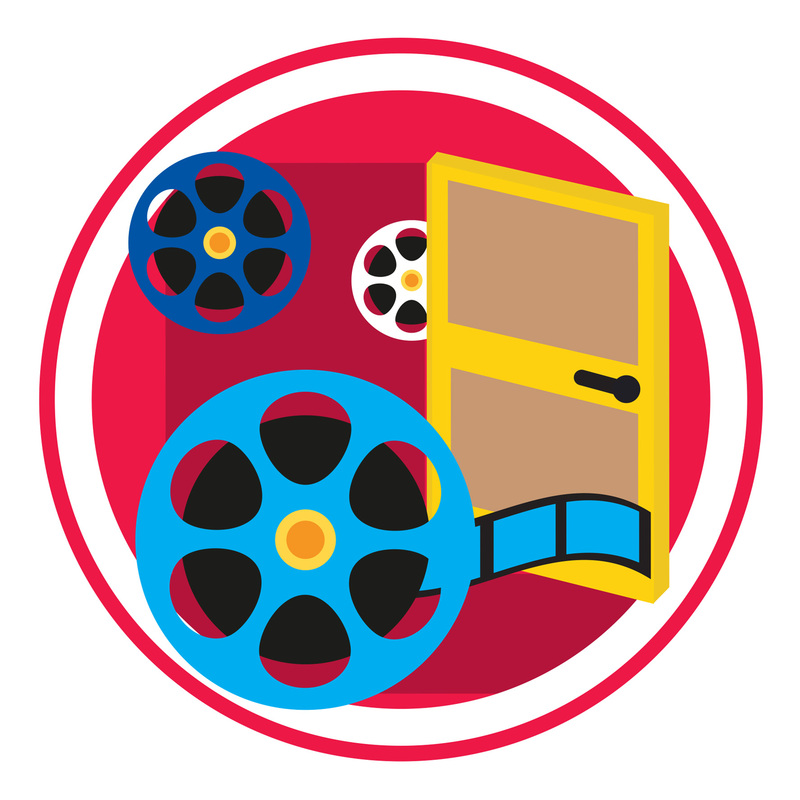 The film collection of the Lichtspiel consists mainly of short films of all kinds, with a strong focus on amateur material. 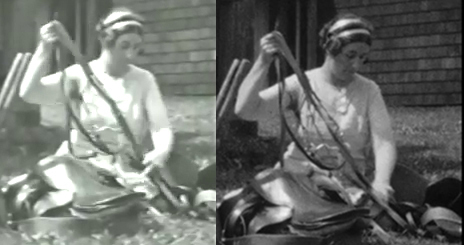 In 2017 we were able to acquire funding for the preservation of a unique collection of 35mm home movies from the late 1920s to the mid 1930s, shot by Robert Ernst from Winterthur on nitrate film and even tinted at times. On the occasion of the UNESCO World Day for AV Heritage we will show 3 of his films, among them his honeymoon to St. Petersburg in 1932. Other travel films will complete the program, which will open with a newsreel from the 1920s and closie with a very local portrait of people and places in Berne from 1952 entitled «Small Suite». Doors open at 19:00, screening starts at 20:00. Screening of the recently found, restored and digitized Judaspengar and the analog restored print of Vårt kronprinspar i Hollywood with introduction by head of the Film Archive, Jon Wengström. When an eccentric collector discovers the showreels of the man who brought moving pictures to the American Heartland, he begins a journey to restore the legacy of America’s greatest barnstorming movieman and save these irreplaceable cinematic treasures from turning to dust. SAVING BRINTON is a “cinephile’s delight” (Hollywood Reporter) about retired Iowa Teacher of the Year Michael Zahs, who makes a remarkable discovery—the century-old films that introduced middle America to the movies. 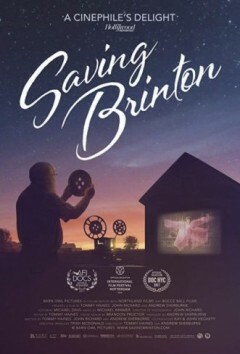 These treasures from Georges Méliés, Thomas Edison and the Lumiere Brothers have somehow survived the ravages of time, and Mike quickly realizes their value, not just to cinephiles, but to his rural community, who rally to put on a show celebrating the legacy of America’s greatest barnstorming movieman, Frank Brinton. 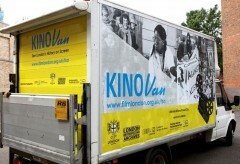 The Kennington Bioscope & The Cinema Museum are delighted to be showing Bill Morrison’s astonishing 2016 documentary film "Dawson City: Frozen Time" an utterly absorbing and many threaded tale of Dawson City, a Yukon Gold Rush town which, finding itself at the end of the line for films distributed and exhibited there in the early 20th Century, buried the then-unwanted nitrate and celluloid films in a disused swimming pool (!) instead of returning them to their distributors. Left undisturbed, and preserved by ice, the films stayed put until their 1978 discovery, bringing back to light this forgotten cache of hundreds of reels of buried film prints, many of which contained otherwise lost titles. Bill Morrison’s magical film also details the growth of Dawson City, and some of the characters who visited and worked there and whose names are still familiar and newsworthy to us today. 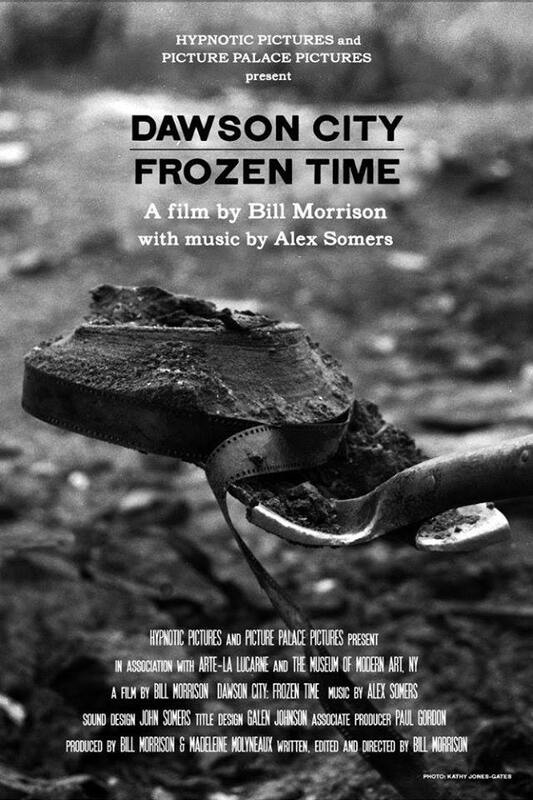 "Dawson City: Frozen Time" was included in over 100 critics’ lists of the best films of 2017 and is a tour-de-force of documentary storytelling and editing, weaving together spellbinding sequences of found films from the silent era, all set to a score by Alex Somers. Director Bill Morrison will be with us tonight on a flying visit to the UK from New York, for a very special onstage conversation with our own Oscar-winning Kevin Brownlow: film historian, film maker and of course tireless champion for silent film. Bill and Kevin will be talking about found and lost films; documentary filmmaking; film preservation and the importance of silent film history and much more. The Rail Rider (1916) & The Closed Road (1916) – starring House Peters and directed by Maurice Tourneur. 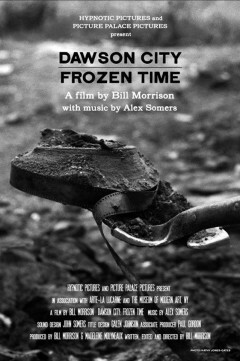 "Dawson City: Frozen Time" is screening from a 35mm print, its sole screening in the UK from this format. Admission £5. Seats are limited, so please reserve a place using the email kenbioscope@gmail.com AND PLEASE NOTE the show will start at 7pm PROMPT. The Kennington Bioscope & The Cinema Museum are delighted to be showing Bill Morrison’s astonishing 2016 documentary film "Dawson City: Frozen Time" an absorbing and many threaded tale of Dawson City, a Yukon Gold Rush town which, finding itself at the end of the line for films distributed and exhibited there in the early 20th Century, buried the then-unwanted nitrate and celluloid films in a disused swimming pool (!) instead of returning them to their distributors. Left undisturbed, and preserved by ice, the films stayed put until their 1978 discovery, bringing back to light this forgotten cache of hundreds of reels of buried film prints, many of which contained otherwise lost titles. 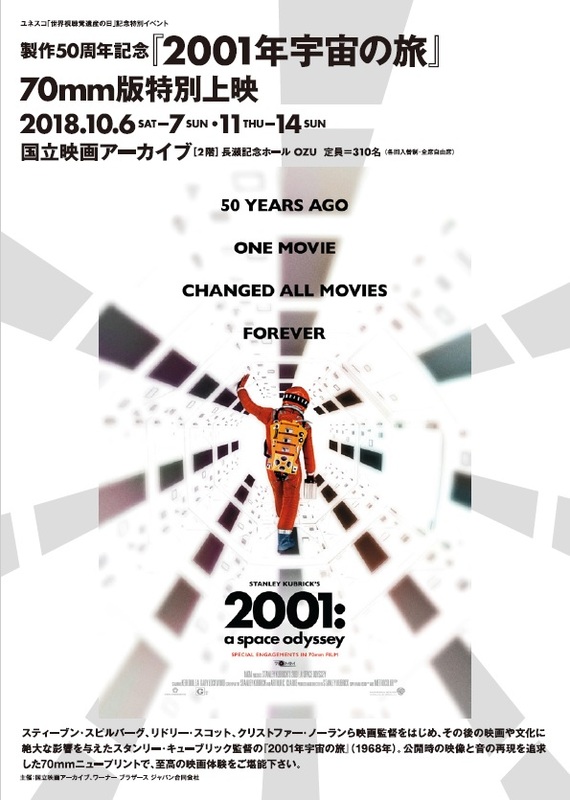 National Film Archive of Japan will celebrate the 50th anniversary of Stanley Kubrick’s “2001: A Space Odyssey” with new 70mm print co-organized by Warner Bros. Japan LLC. Under Christopher Nolan’s supervision, the new 70mm print was made from new elements taken from the original camera negative with no digital remastering, effects, edits, or other. 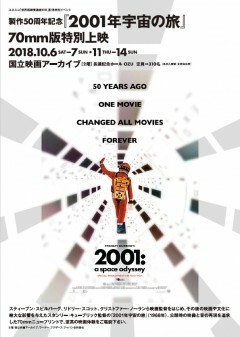 The new 70mm print has toured in Europe and USA after the premier at Cannes Film Festival in May 2018, now finally coming to Japan! 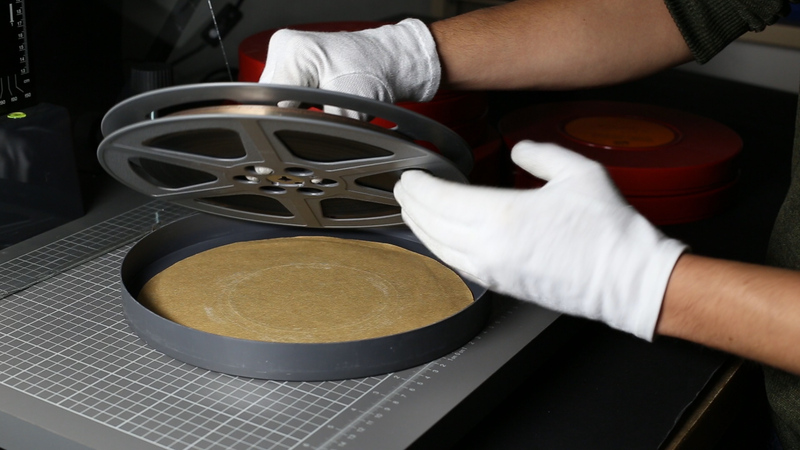 As a member of FIAF (the International Federation of Film Archives), TIFF actively acquires 35mm prints in order to both preserve and present films in their original format. 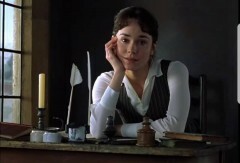 To mark the UNESCO World Day for Audiovisual Heritage, an annual event which aims to raise awareness of the need for film preservation and the conservation of our audiovisual heritage, the Film Reference Library is proud to present a screening of Patricia Rozema's Mansfield Park on a 35mm print from TIFF's collection. The screening will be introduced by a veteran film reviser from TIFF's Technical Production Services team, who will provide insight on the film inspection process. 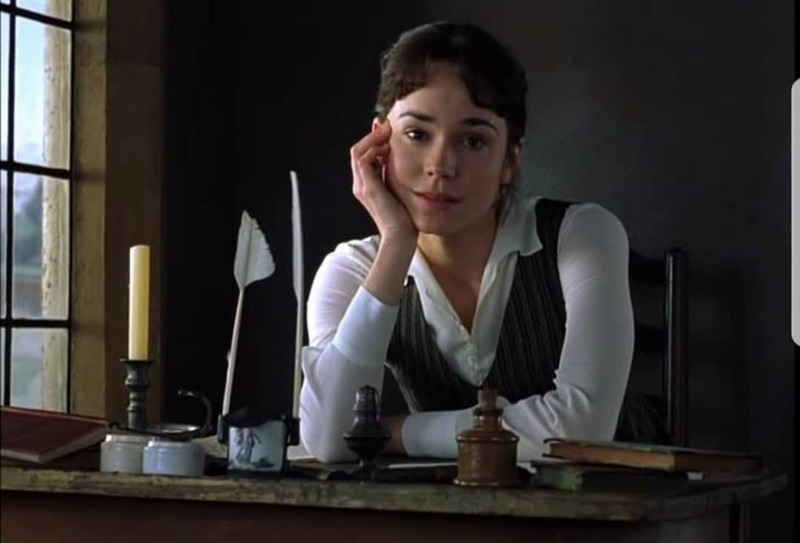 About the film: Toronto New Wave auteur Patricia Rozema made a leap to the international art-house circuit with this elegant and inventive adaptation of the Jane Austen novel, incorporating elements from the author's own life, foregrounding the role of slavery in funding the placid country-estate lifestyle of her characters, and making the protagonist Fanny Price (Frances O'Connor) considerably more woke than the timid heroine of the book. "Carnets de voyage filmés, regards sur l'ailleurs par des cinéastes amateurs"
Visite commentée, projection pellicule et apéritif convivial autour de « Carnets de voyage filmés, regards sur l'ailleurs par des cinéastes amateurs », exposition réalisée à partir des collections de la Cinémathèque des Pays de Savoie et de l’Ain; de la Cinémathèque de Bretagne, de Normandie Images, de l’association Ton Anonymon d’Athènes, de Home Movies de Bologne, du Musée Ethnographique de Genève et du Pôle Culture Patrimoine du Département de la Haute-Savoie, au sein du projet INTERREG V France-Suisse 2014-2020 EntreLACS - Fonds Européen de Développement Régional. Screening of Ingmar Bergman's "lost" film "Sånt händer inte här"
Cinemateket Oslo celebrates the Ingmar Bergman centennial with events and screenings throughout the year. The screening of Ingmar Bergman’s rarely screened, and by the filmmaker himself banned film, «This Can’t Happen Here» («Sånt händer inte här», 1950), is dedicated to the 2018 World Day for Audiovisual Heritage. Jan Langlo, head of Cinemateket, will introduce the screening. Is your institution affiliated to any of the CCAAA associations ? The references of the message as well as your name and email will be forwarded to the recipient. ARE YOU SURE YOU WANT TO REMOVE THIS PUBLICATION?